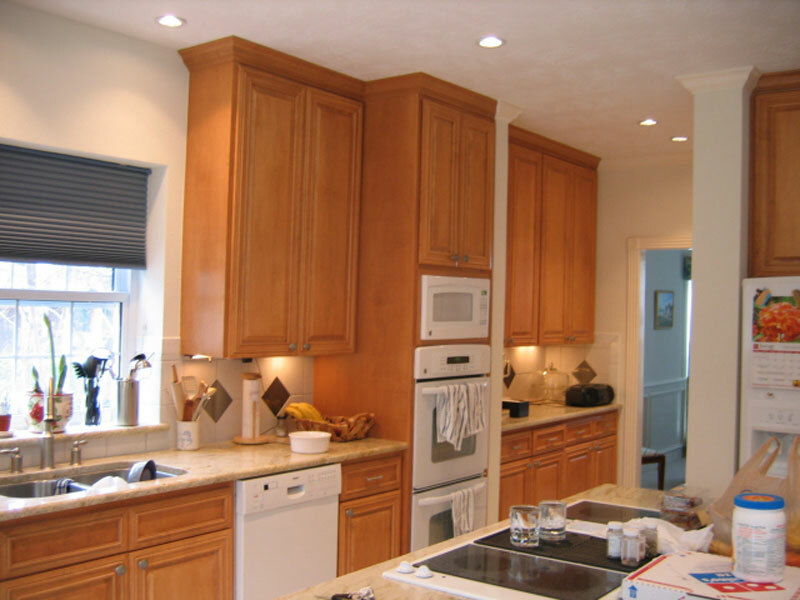 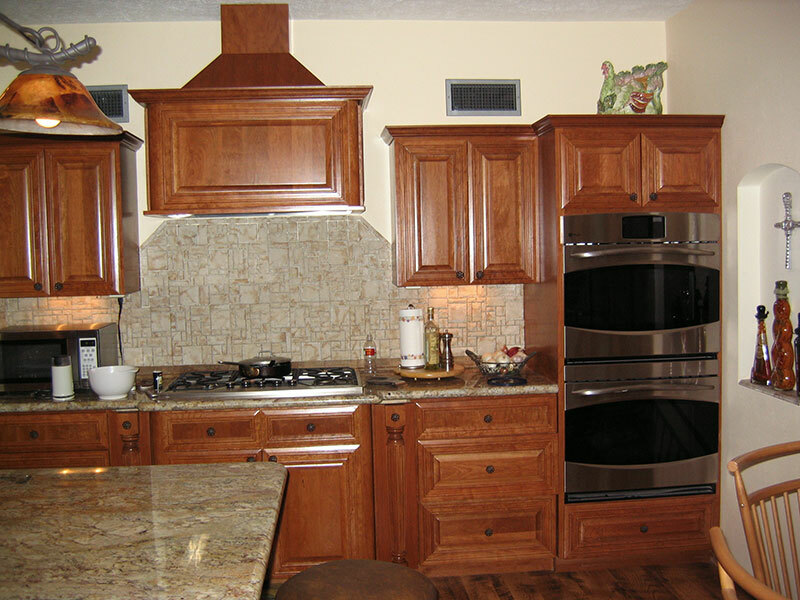 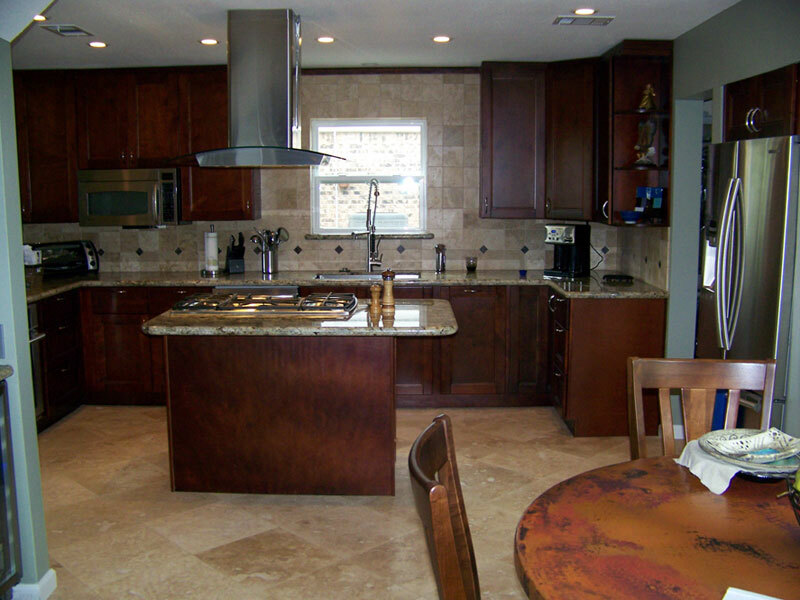 Cherry stained maple kitchen cabinets, with an upgraded granite countertop and a cream antique (honed) travertine backsplash with undercounter lighting and special low profile switches and outlets hidden under the upper cabinets. 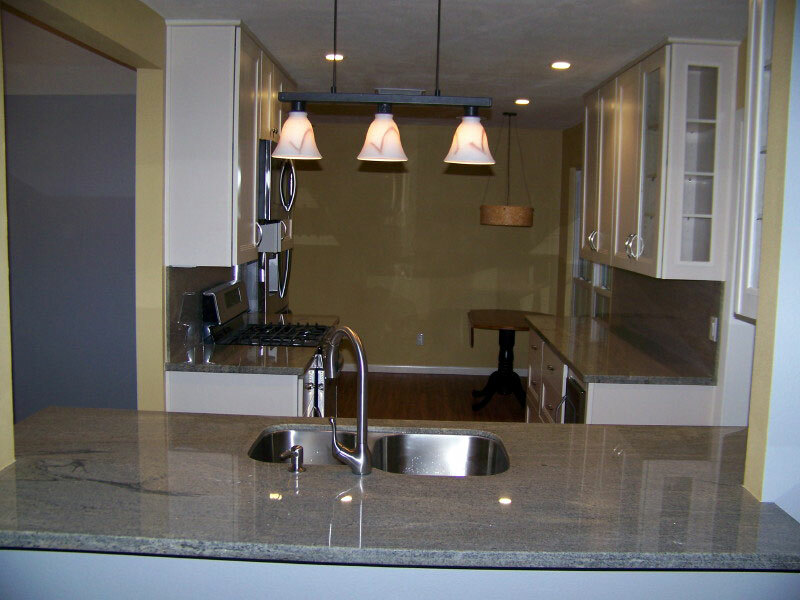 This project included the transformation of a 40 year old Meadowgreen subdivision home by the opening of three adjoining room into one large kitchen and entertaining area. 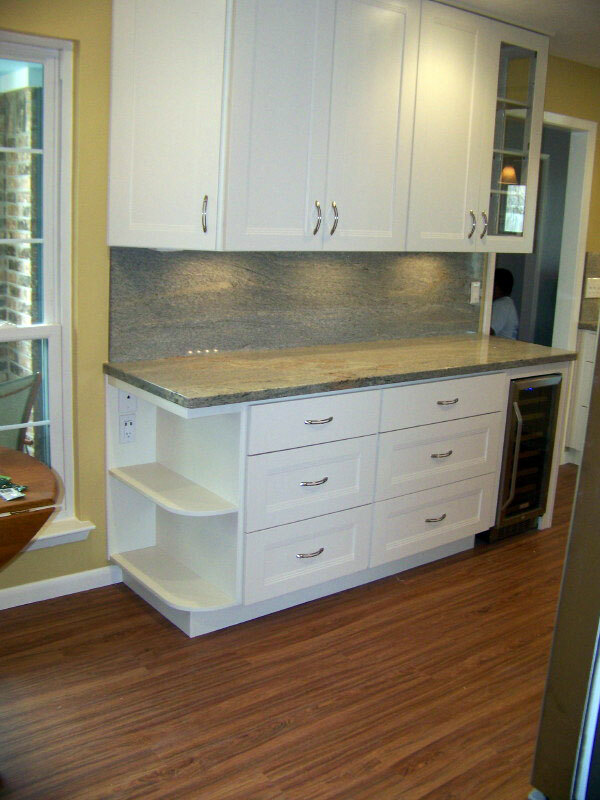 The floors are (18X18) ivory travertine complete with custom inlays and features. 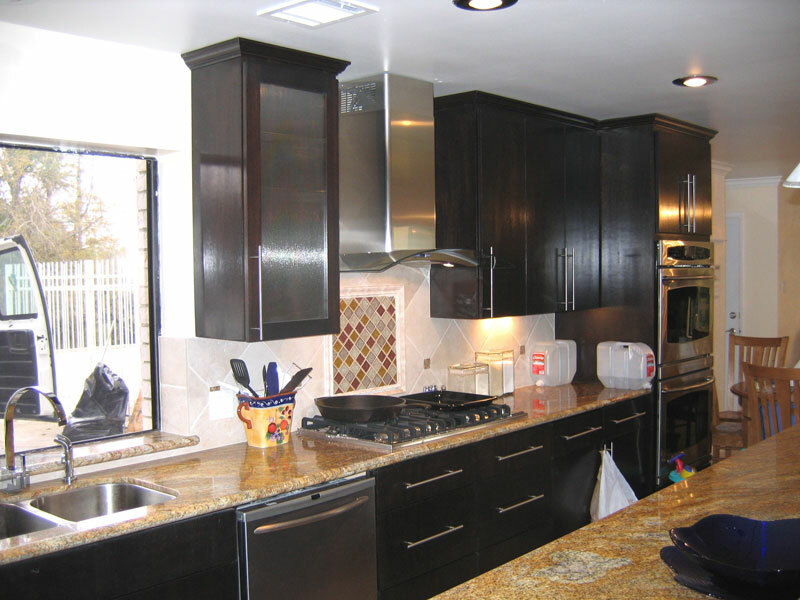 The project included a revamped cherry stairway with steel balustrades and newel. 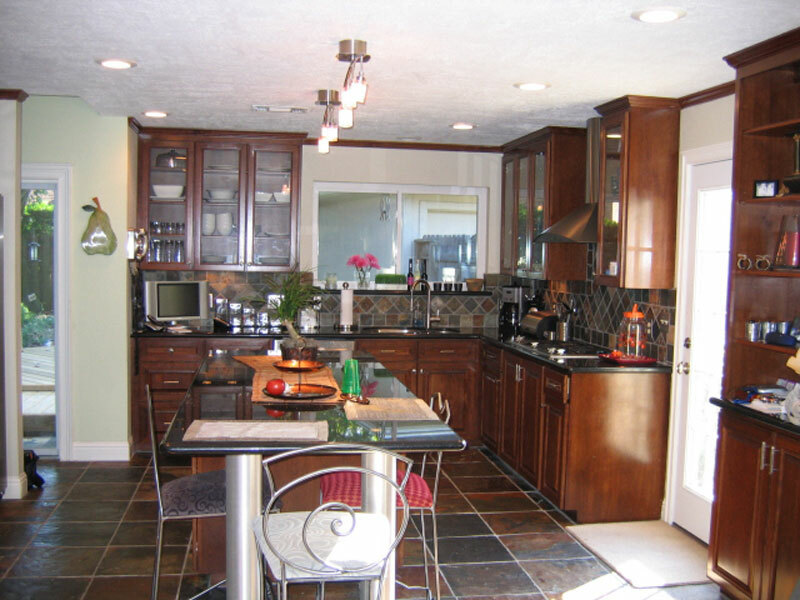 This Webster home was remodeled with all new wall, ceiling, and floor finishes. 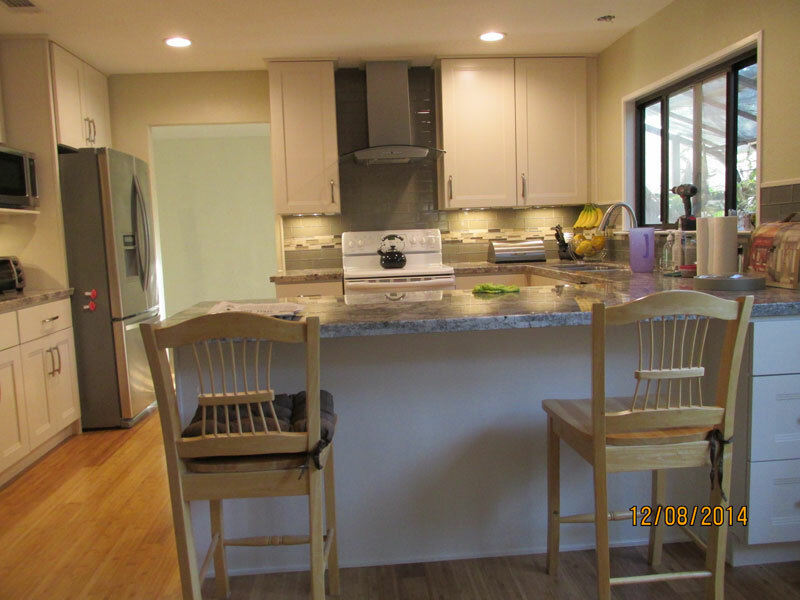 The original kitchen footprint remained the same with cabinet function changes, updated LED recessed can lighting, LED undercounter lighting and concealed backsplash electric service. 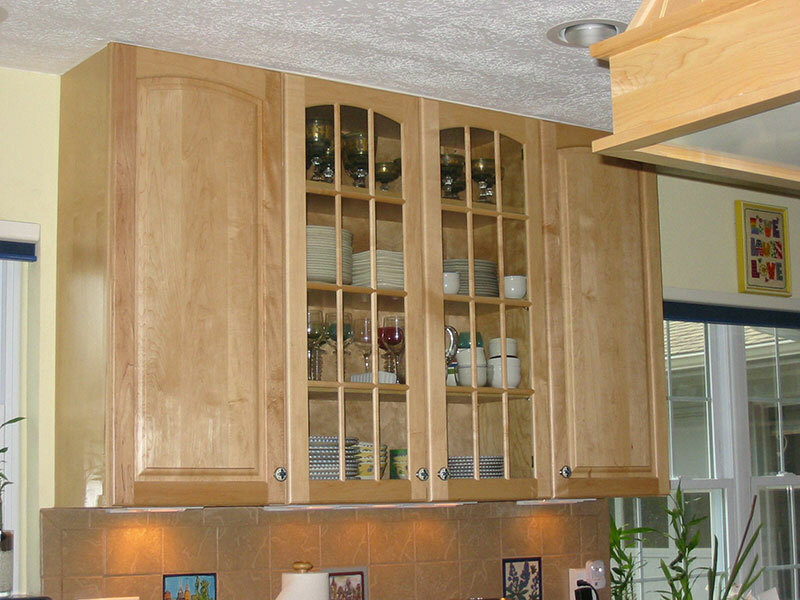 The furrdowns were also removed to allow full use of 42” upper cabinets. 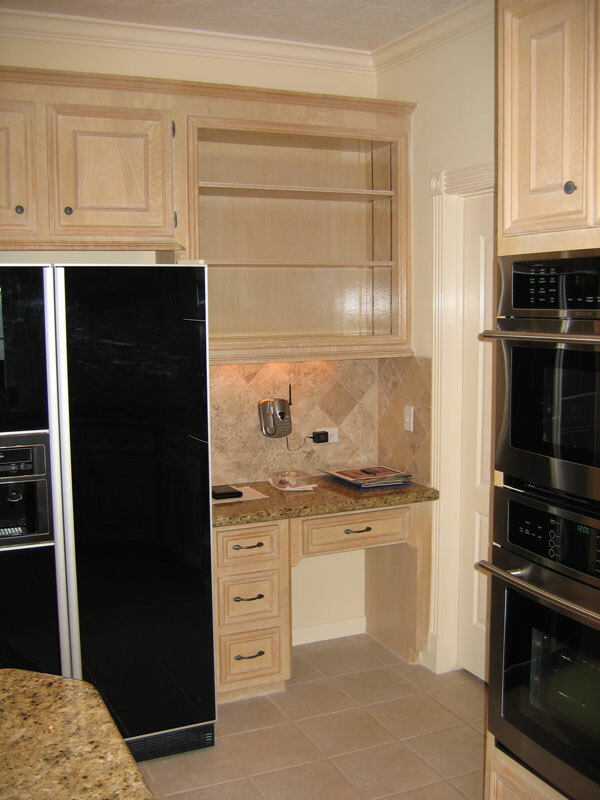 All cabinets have a top drawer and double pullouts below. 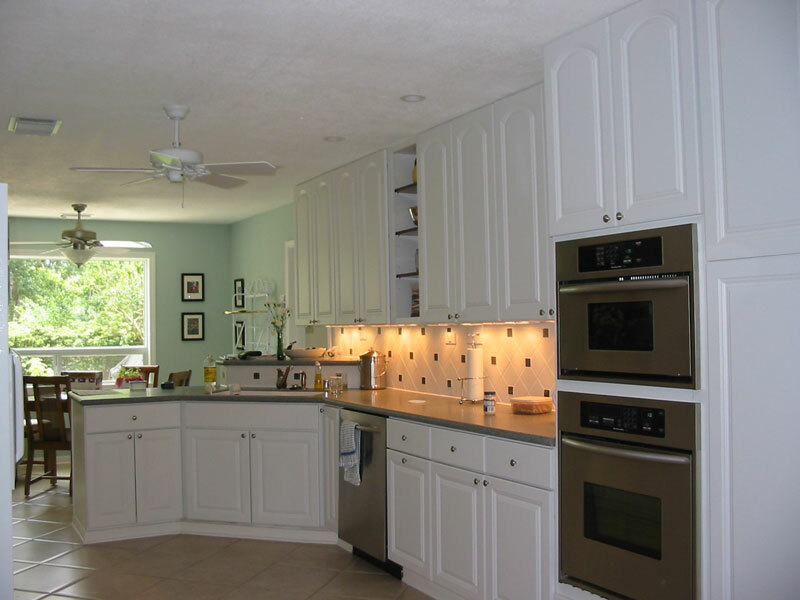 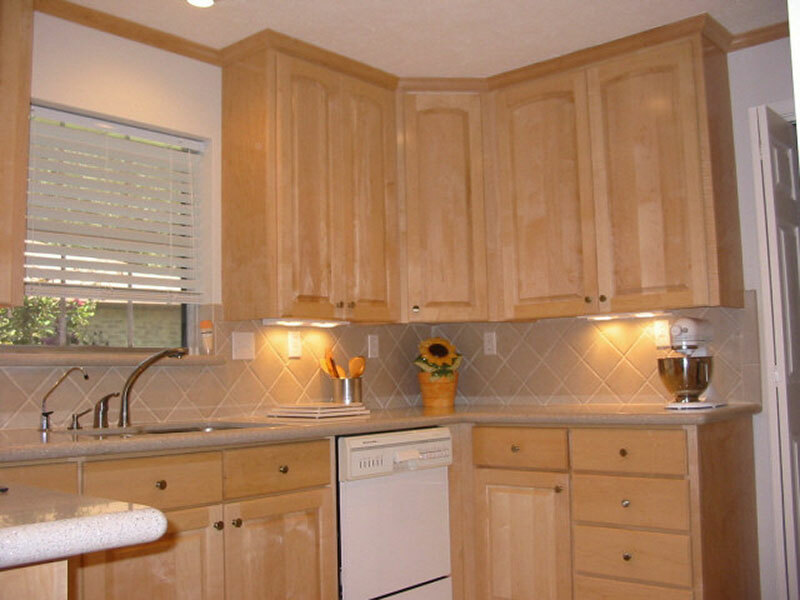 This kitchen is Vanilla White with fluted mission style doors. 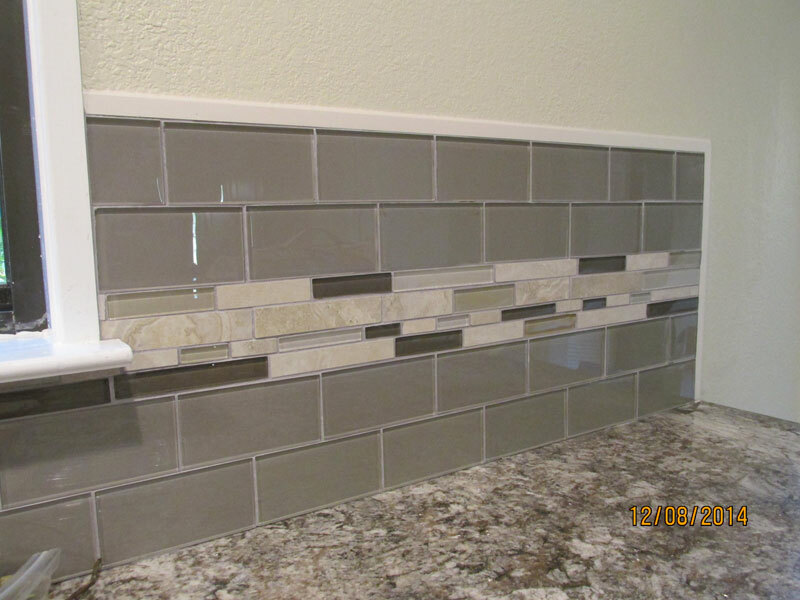 The backsplash tile is light gray glass tile with a color blended stacked glass accent strip. 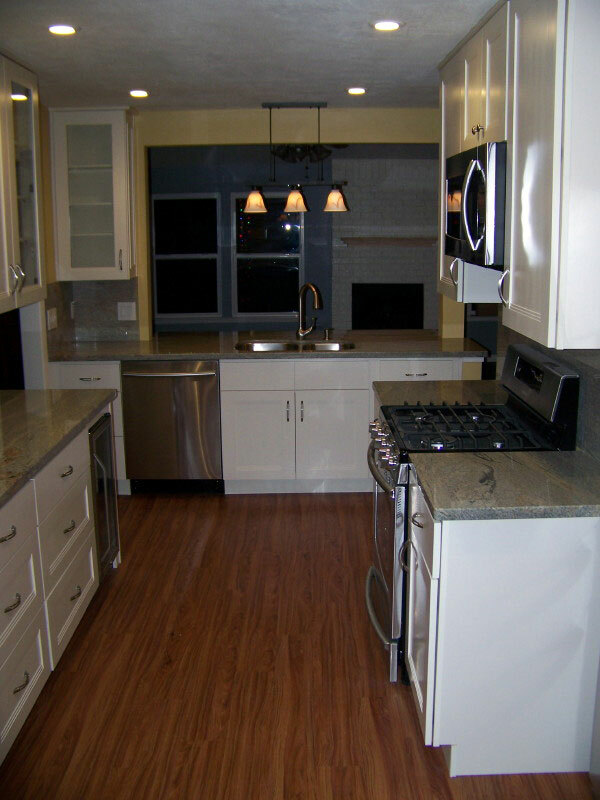 The floors were completed in true wood horizontal carbonized bamboo. 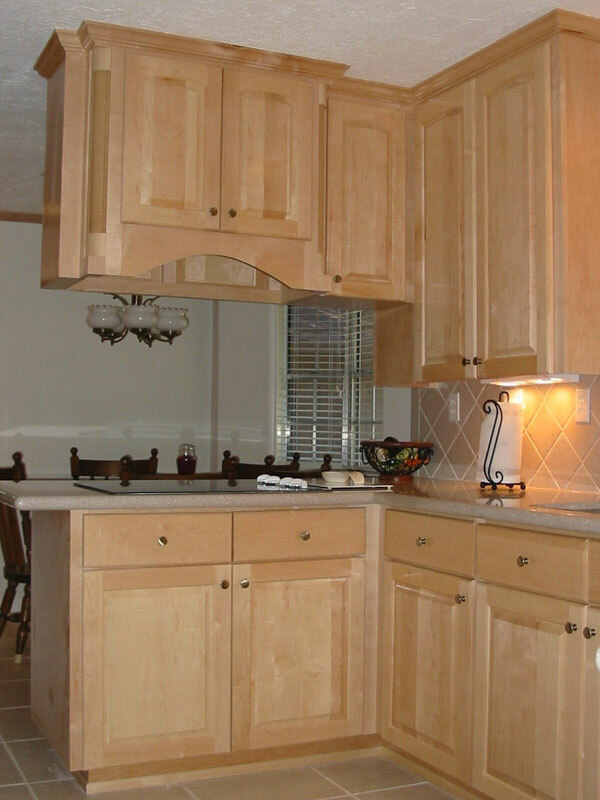 This Meadowgreen subdivision home had a tight and confined kitchen space tucked away behind walls. 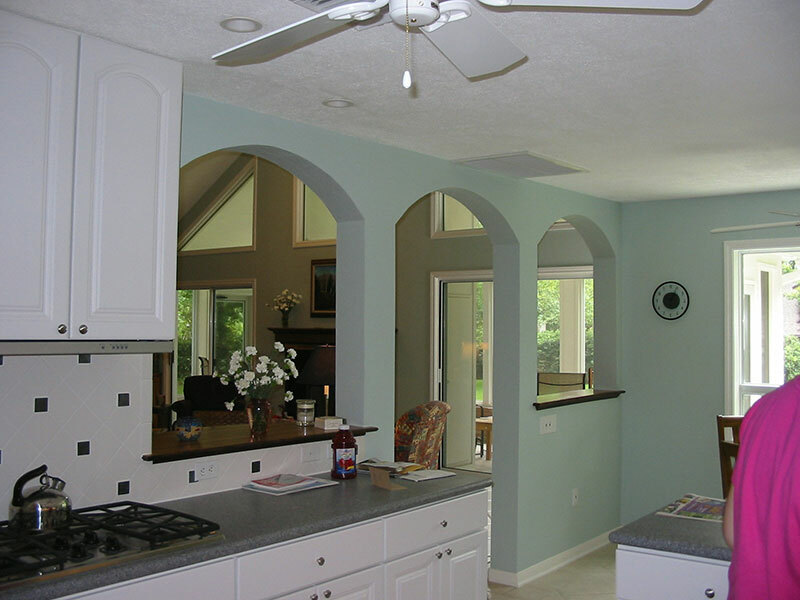 The opening to the family room and adjoining dining room were both expanded to allow better flow and openness. 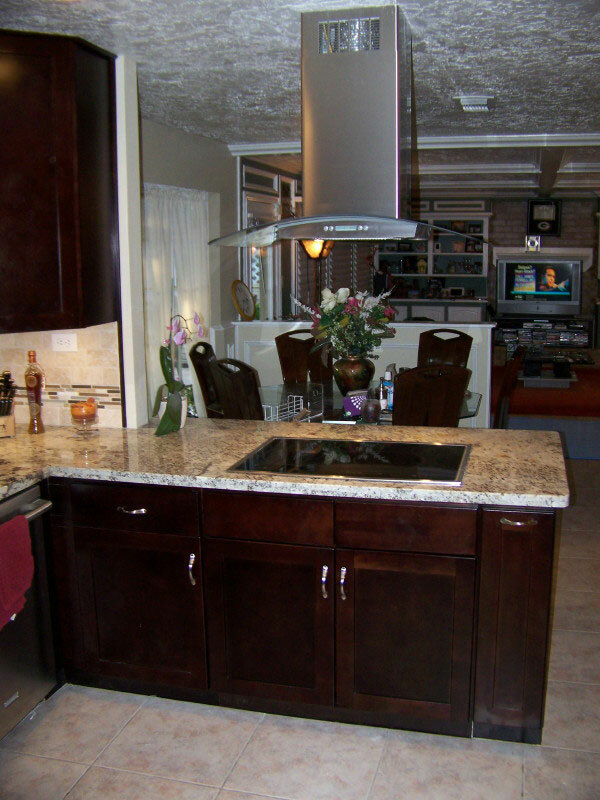 The pass thru was widened and raised to allow an extended bar and buffet for ease of entertaining and function. 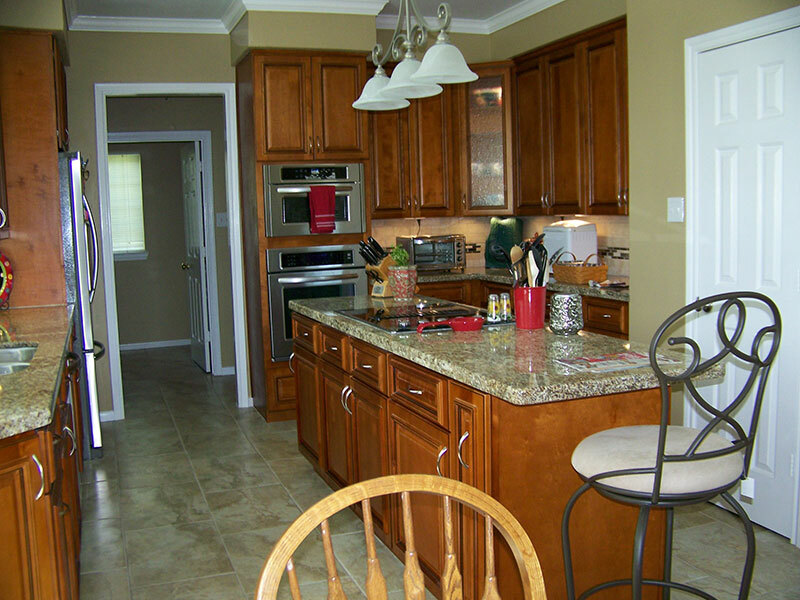 The fridge and a pantry were relocated at the opposite end of the kitchen closer to the breakfast room. 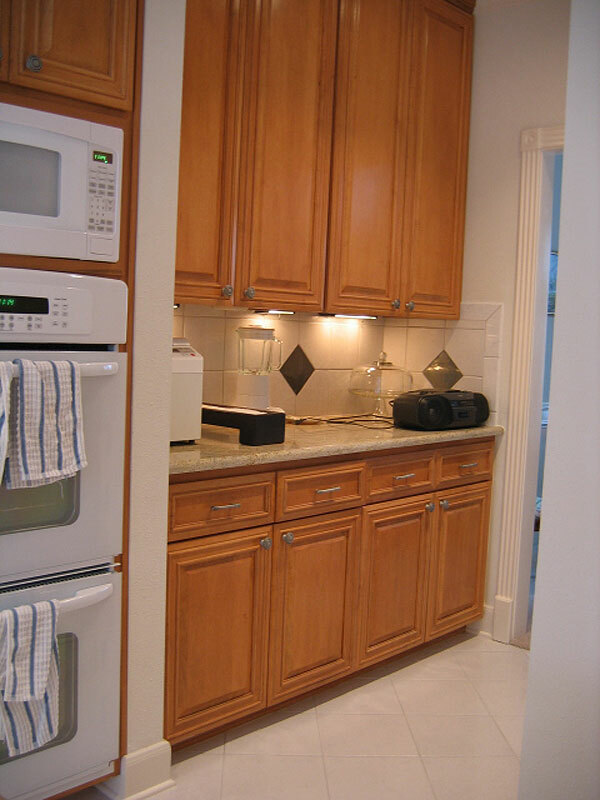 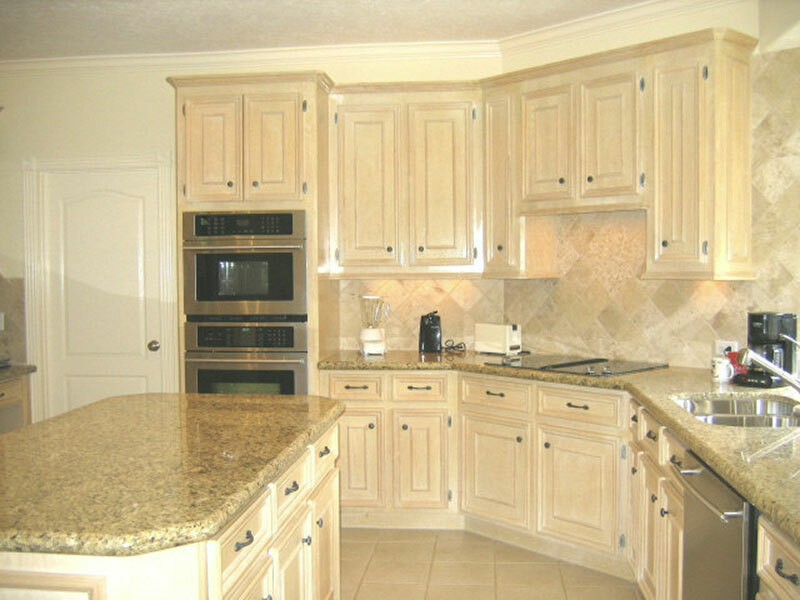 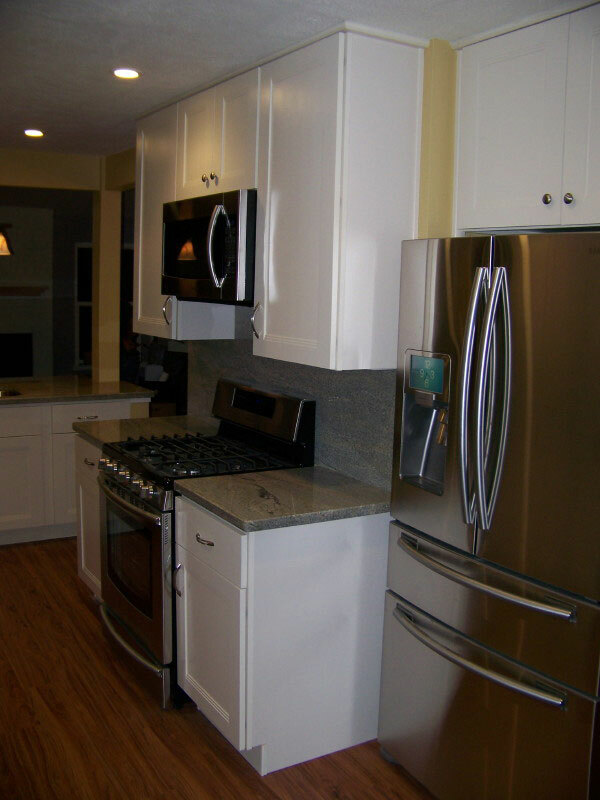 The cabinets are Vanilla White with flat panel fluted mission style doors. 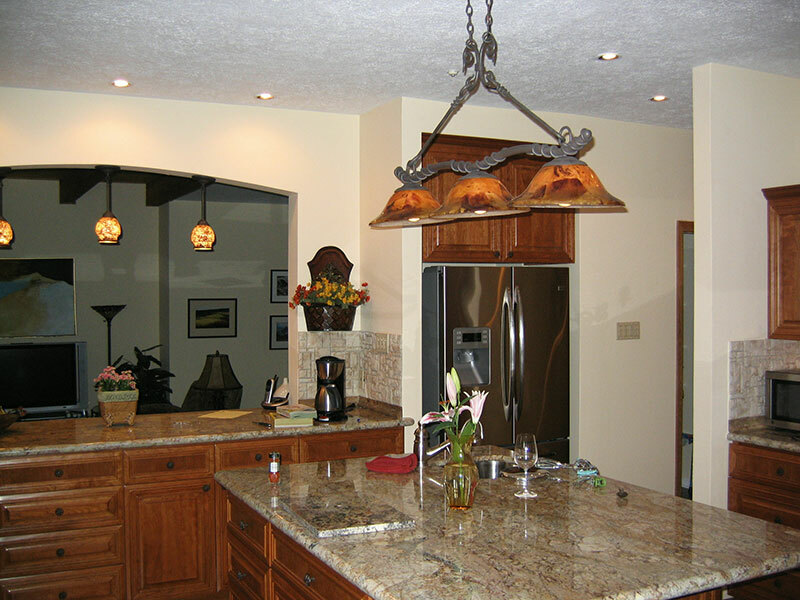 The ceiling and backsplash received all new LED lighting and updated service. 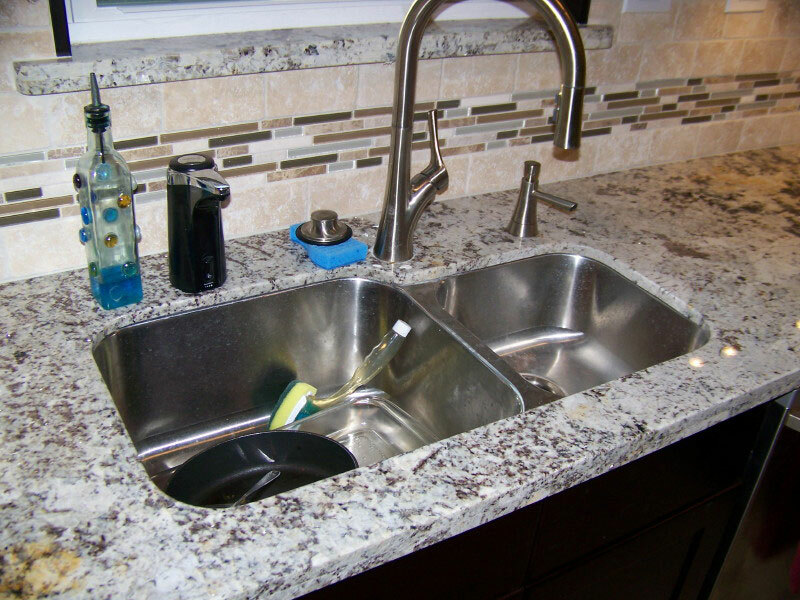 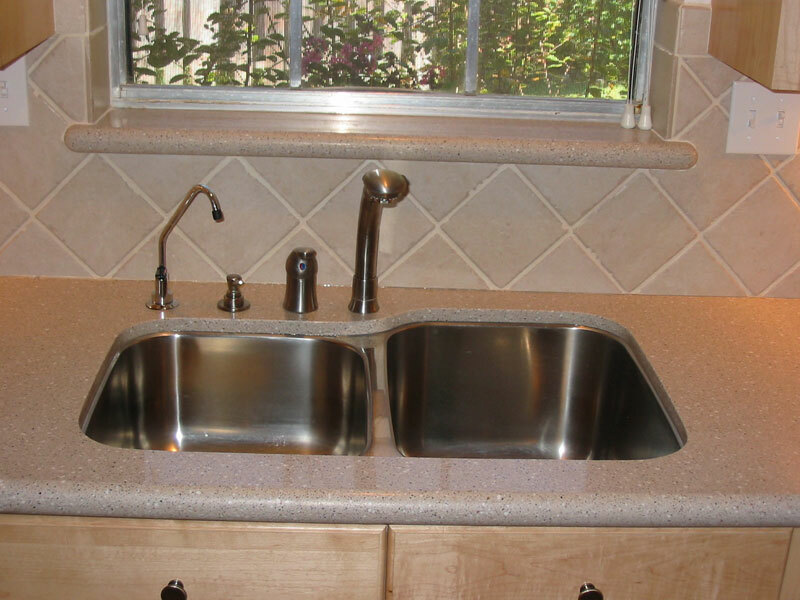 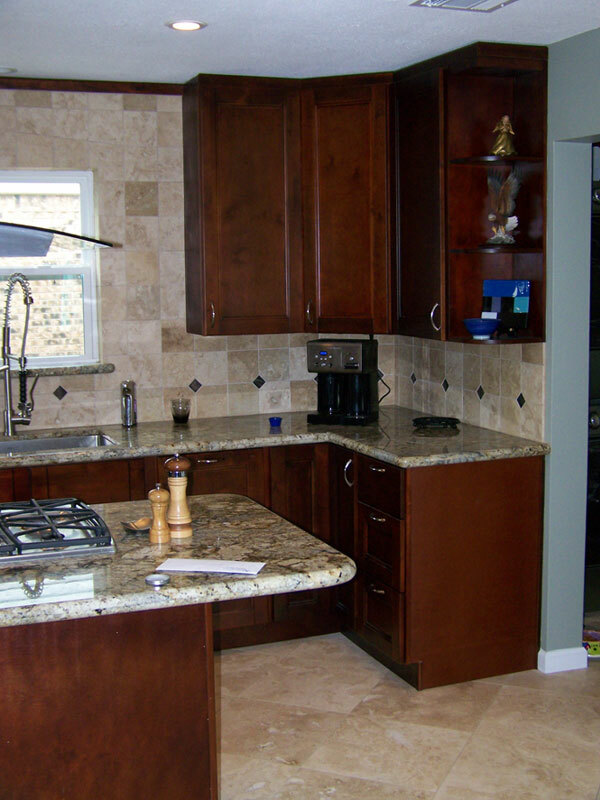 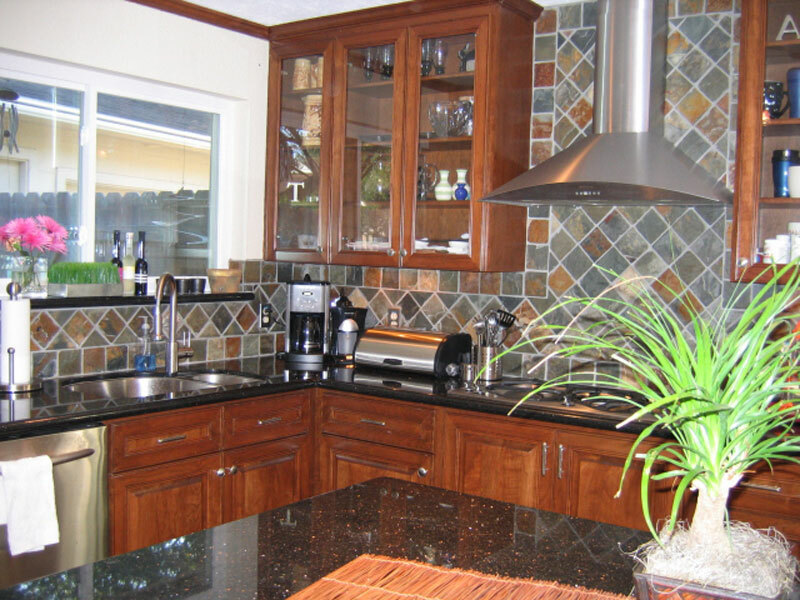 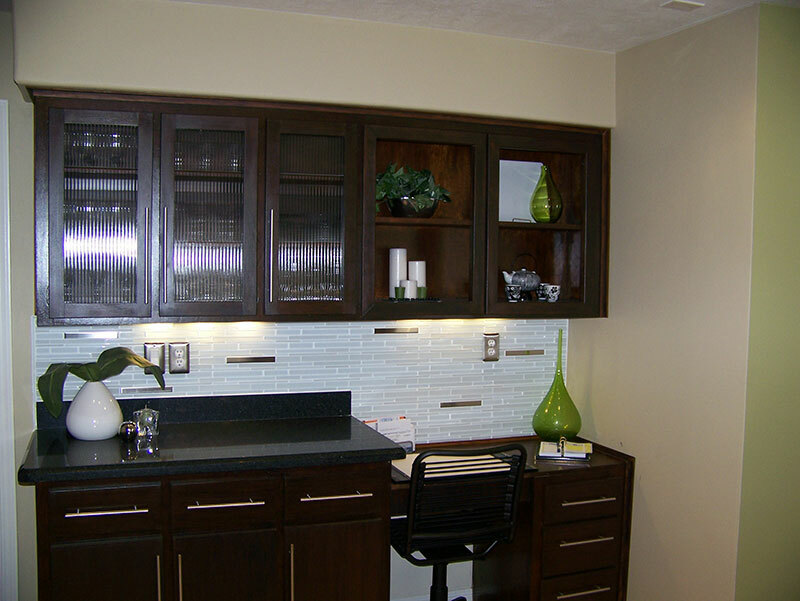 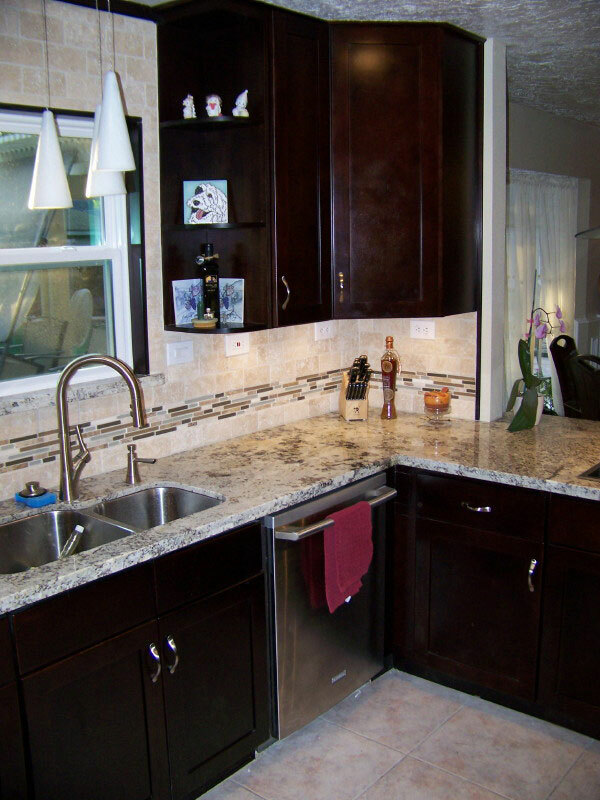 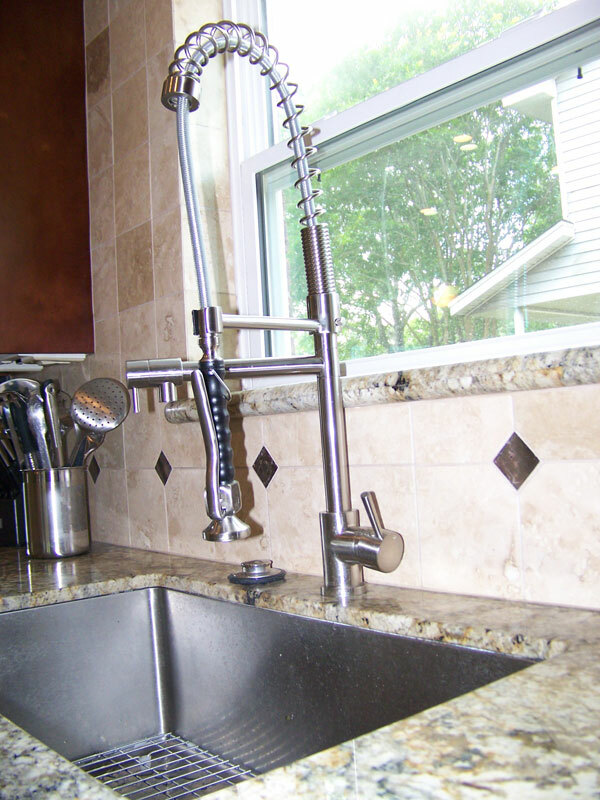 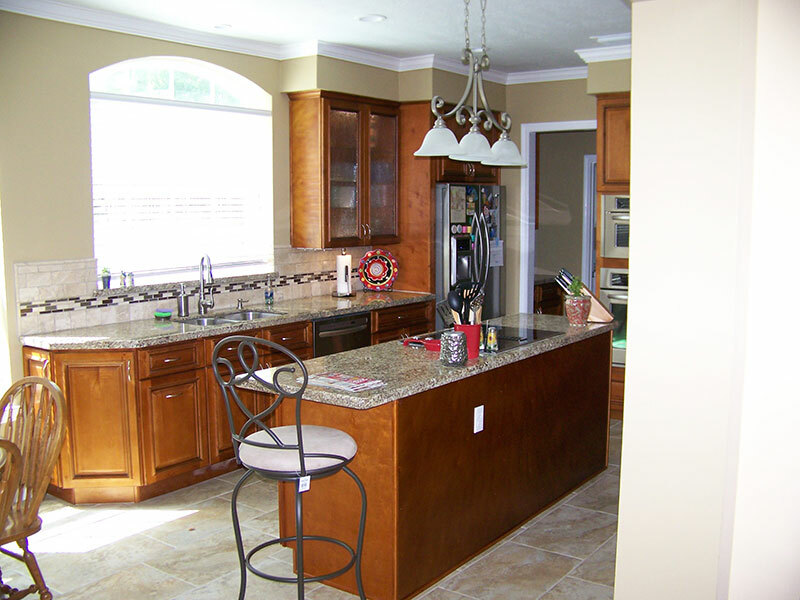 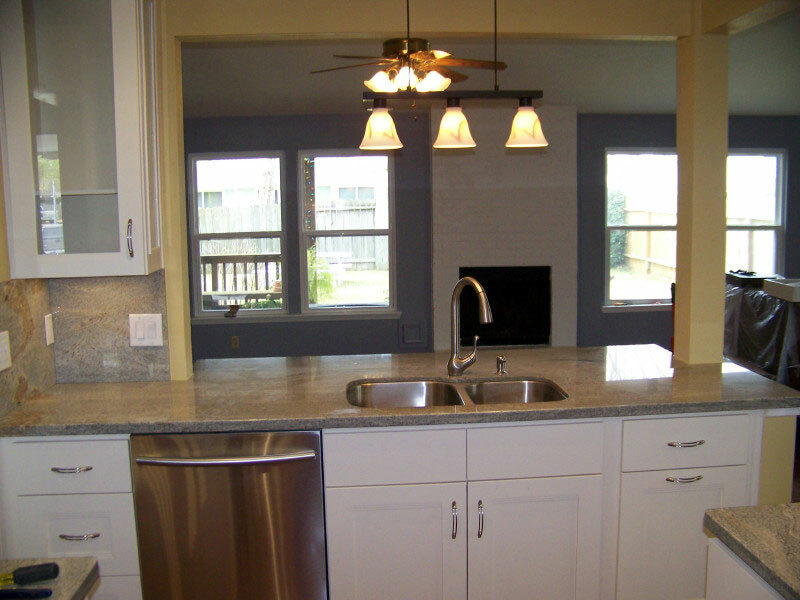 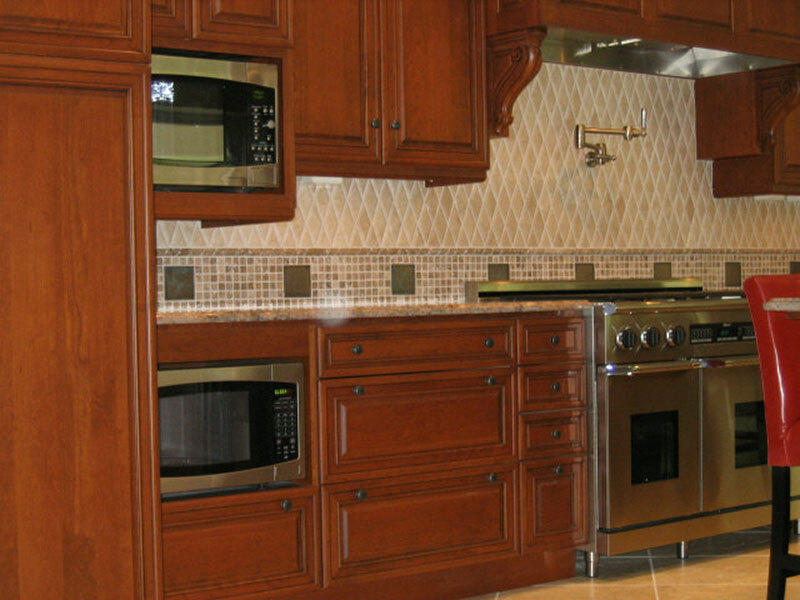 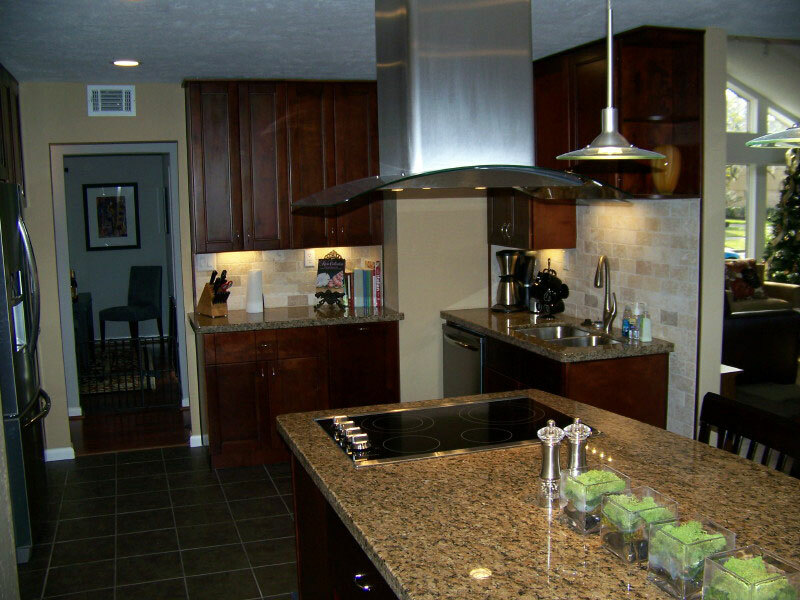 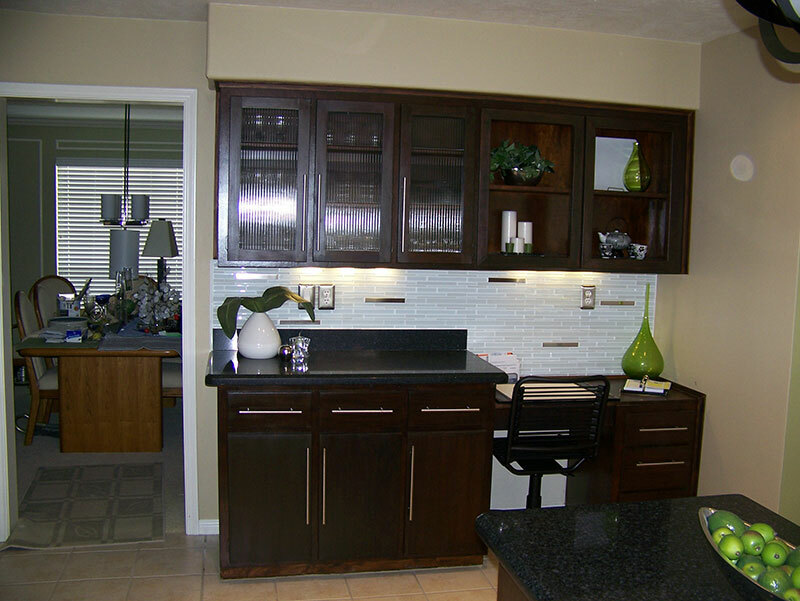 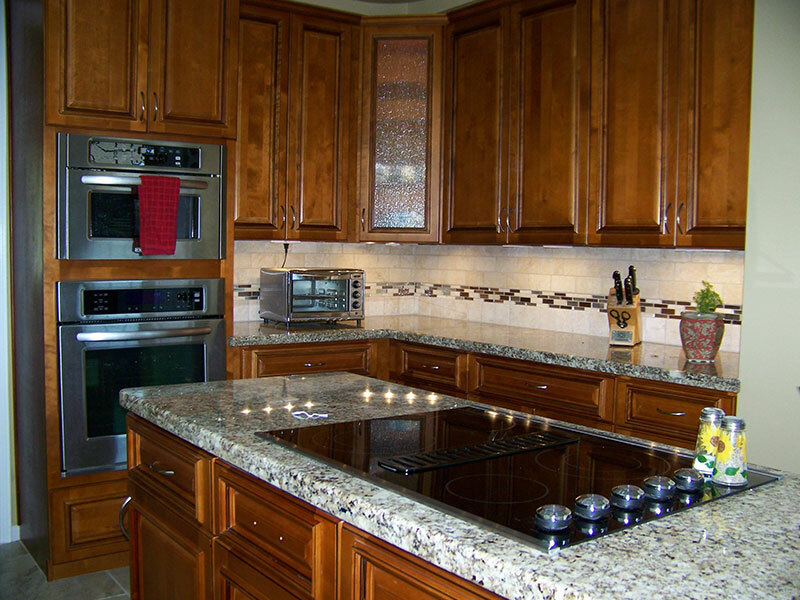 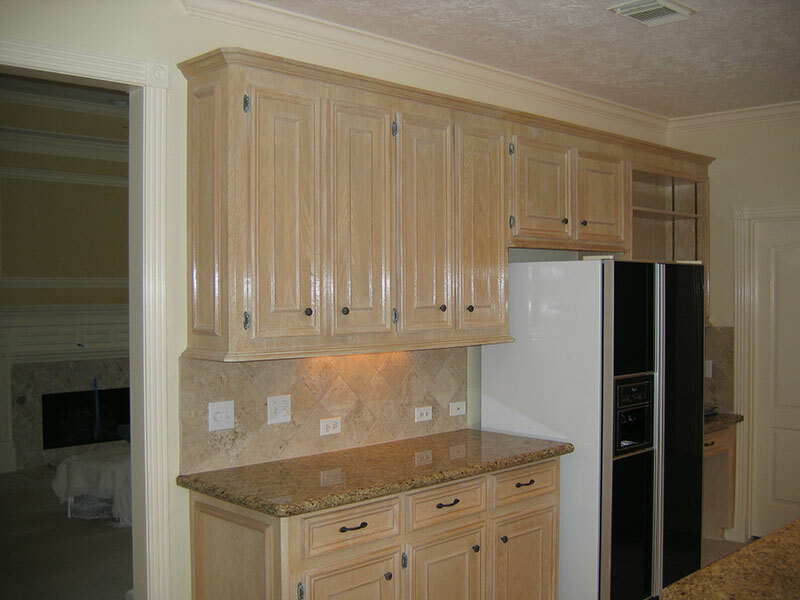 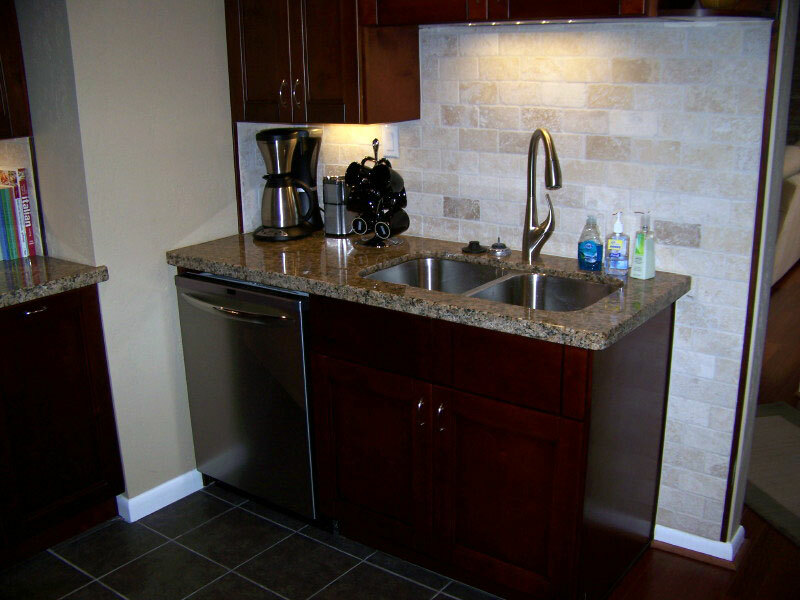 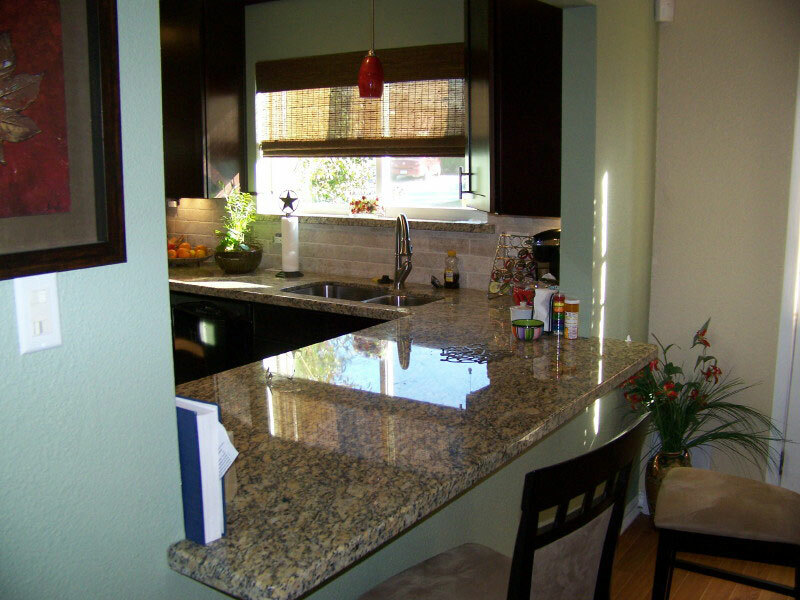 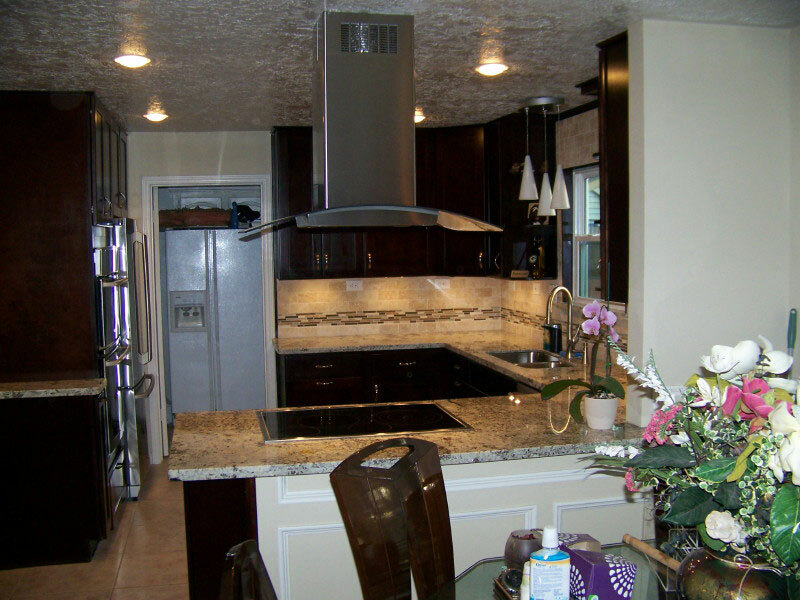 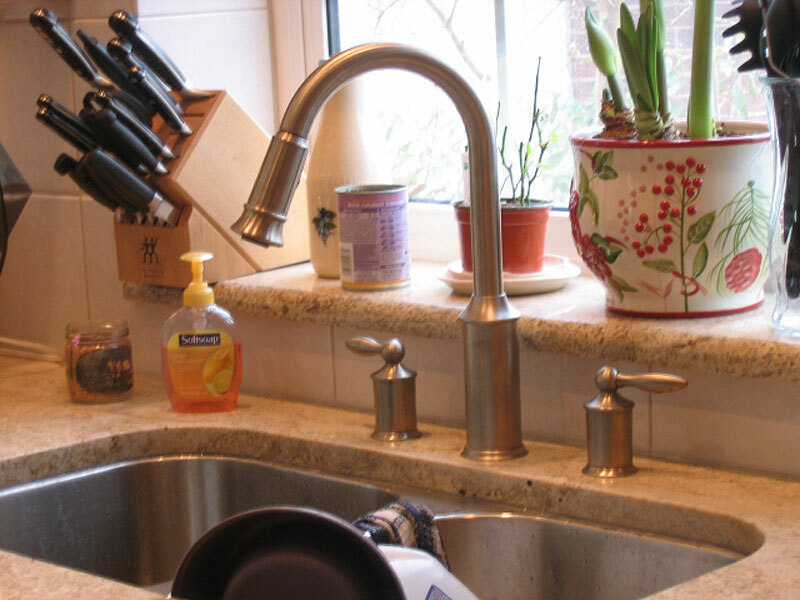 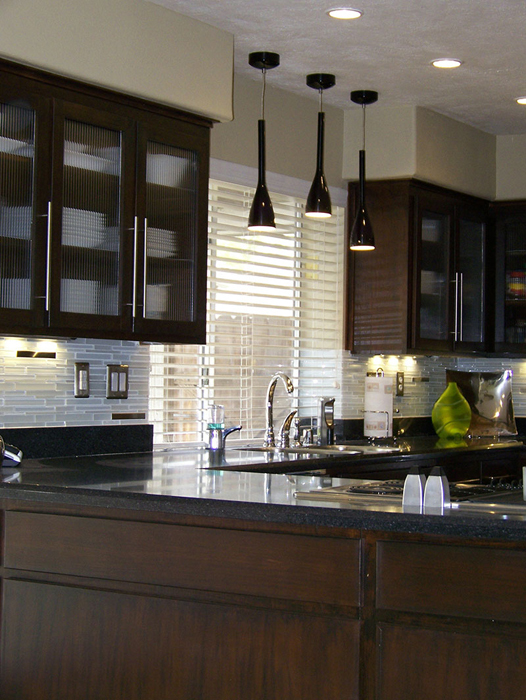 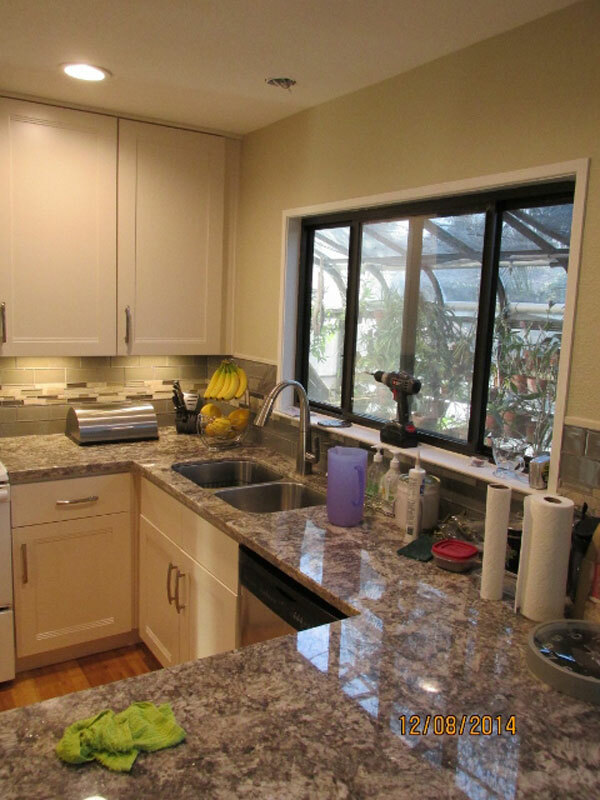 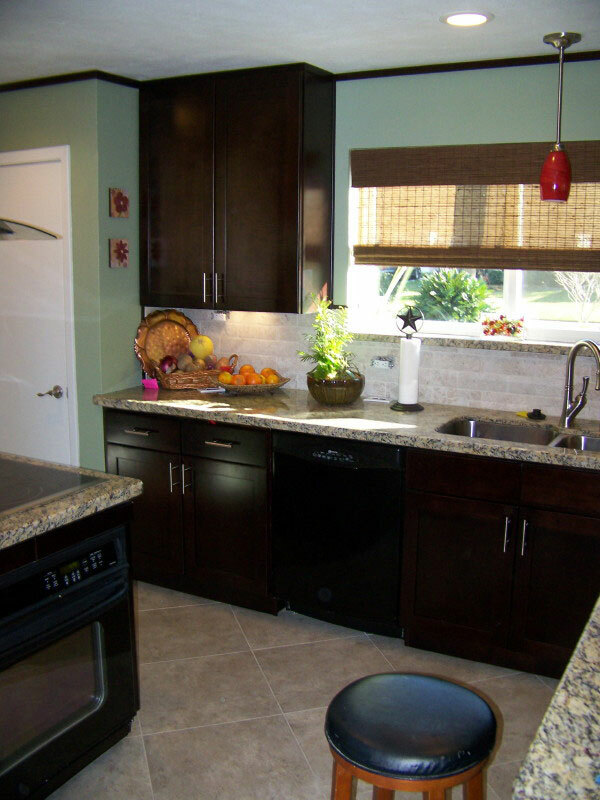 The custom granite was selected for use on the countertops as well as for the full backsplash. 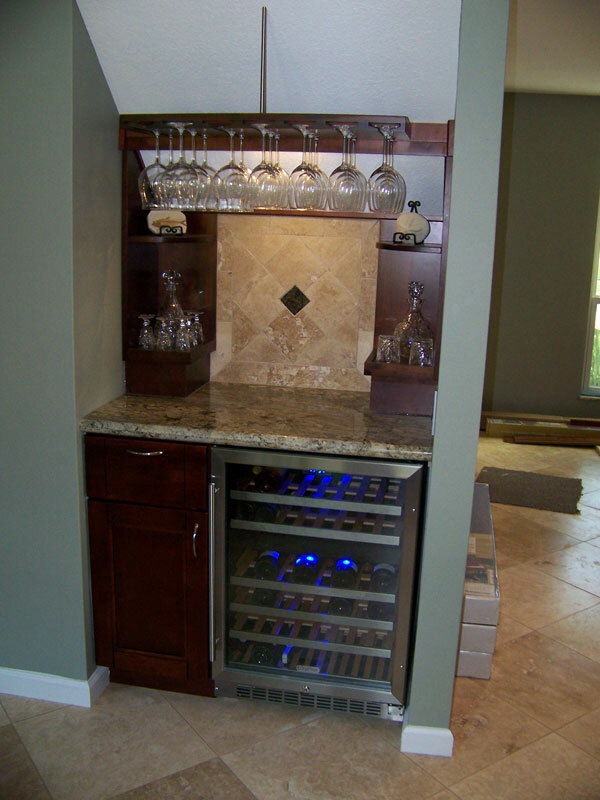 All appliances were installed new, with some location changes, as well as a neat wine cooler that fit close to the buffet bar and sink. 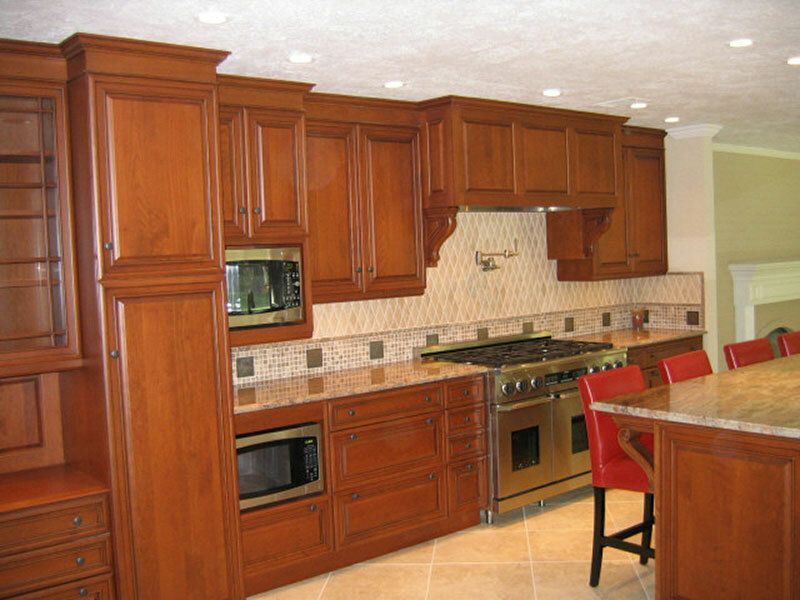 This Pine Brook house has a large and open kitchen /breakfast room/family room area that was perfect for a colorful cabinet finish. 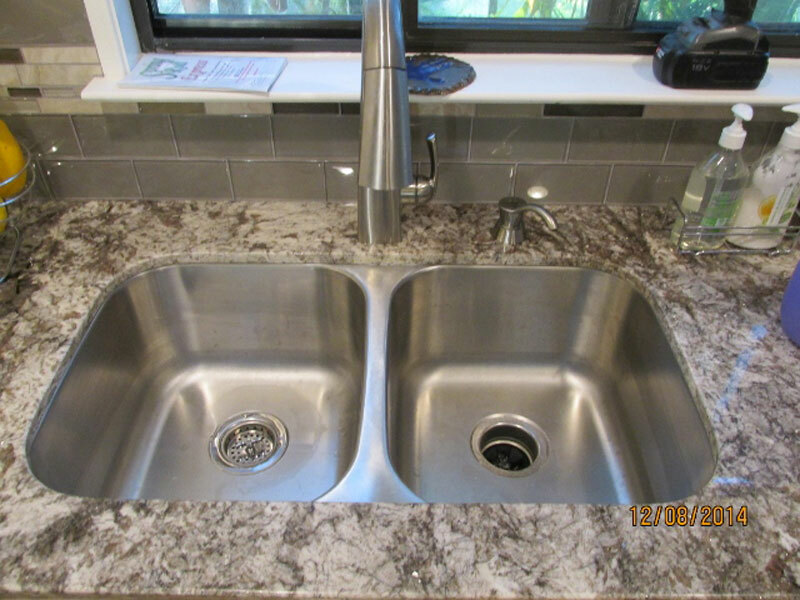 Some of the appliances have new locations to improve work flow, and the island was lengthened and all the cabinets are fully functional to make the most of storage space to keep countertops clear. 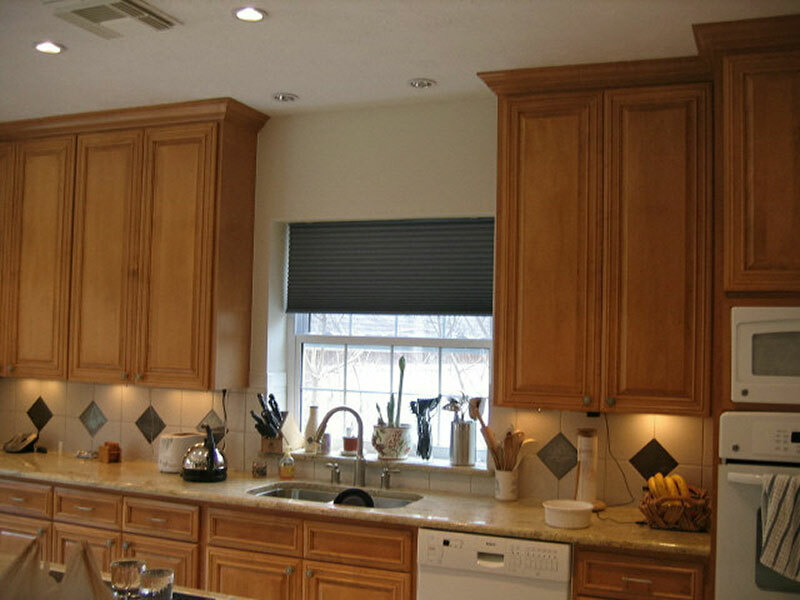 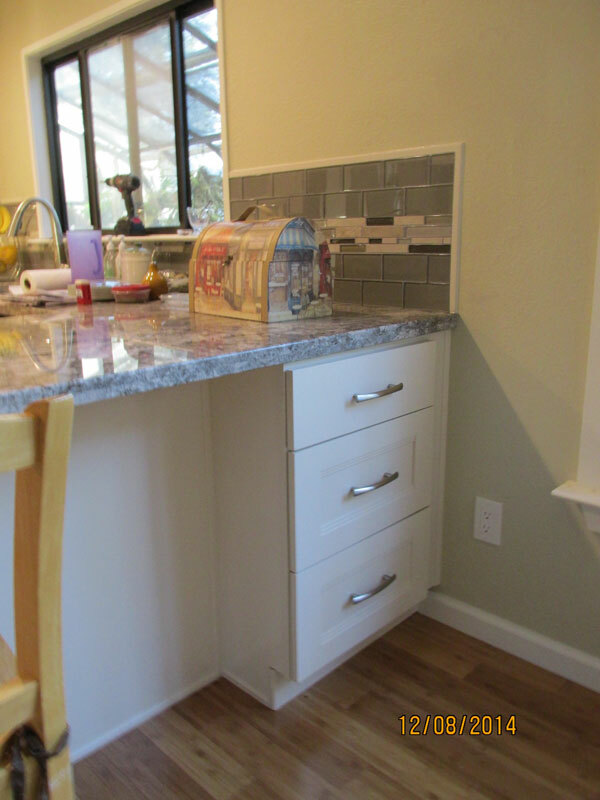 A blind corner double pull out was installed in the kitchen’s only inside corner to fully maximize storage. 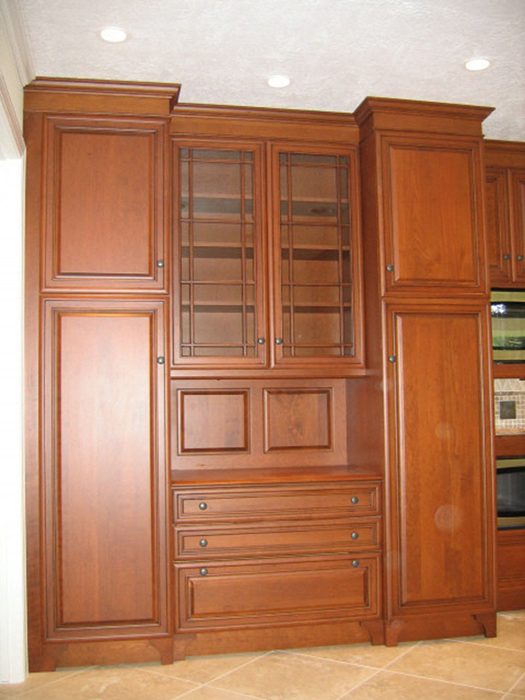 The cabinet is a cherry spice stain on maple both inside and out. Being of all wood construction eliminates the chance of water caused damages in the future. 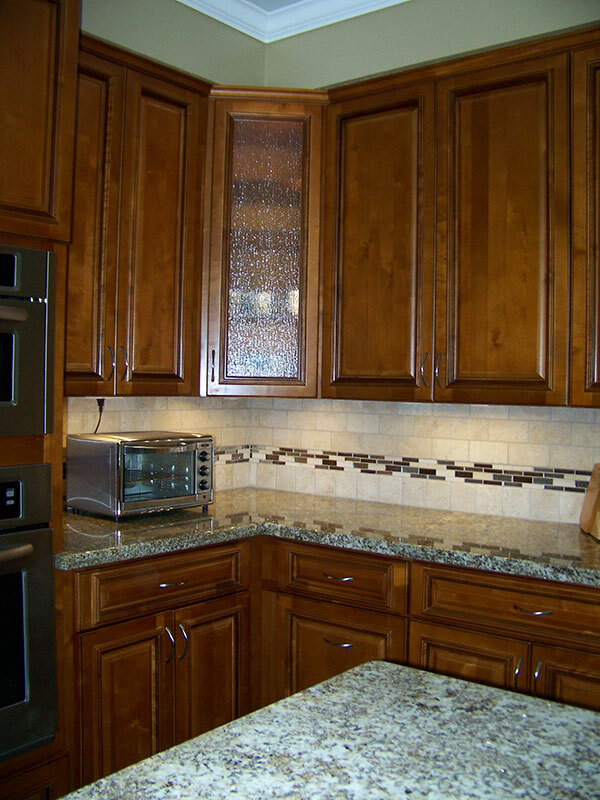 The doors are full face raised panel with a sculpted perimeter trim. 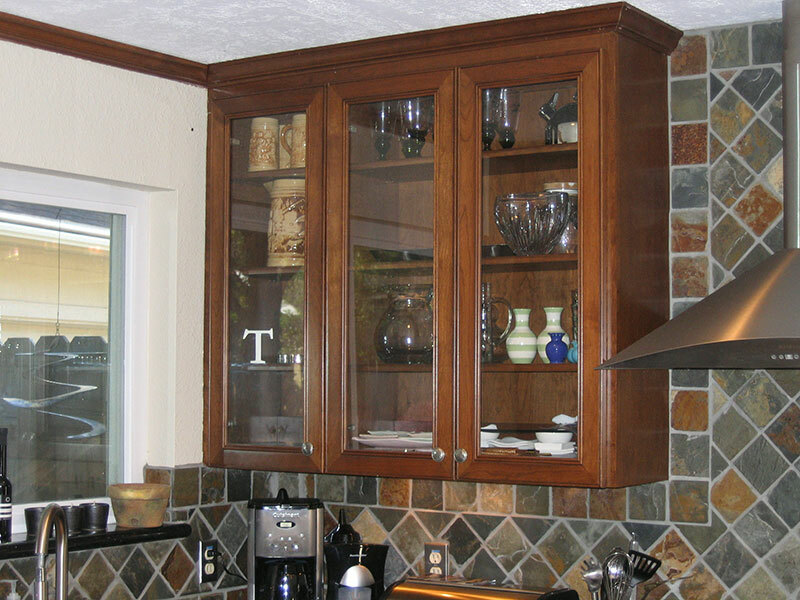 There is a single black inlay in the center of the trim for highlighting. 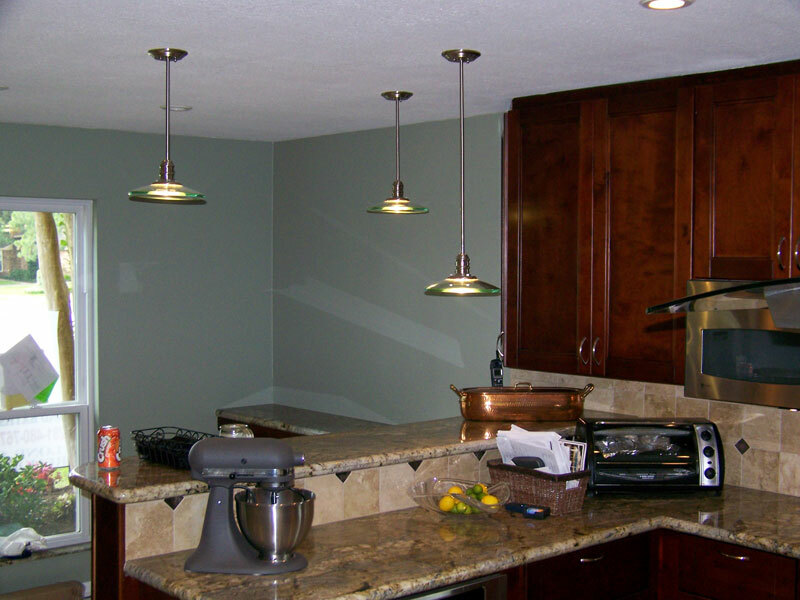 All lighting was changed to LED (by a licensed electrician) as well as positioned to compliment the open layout. 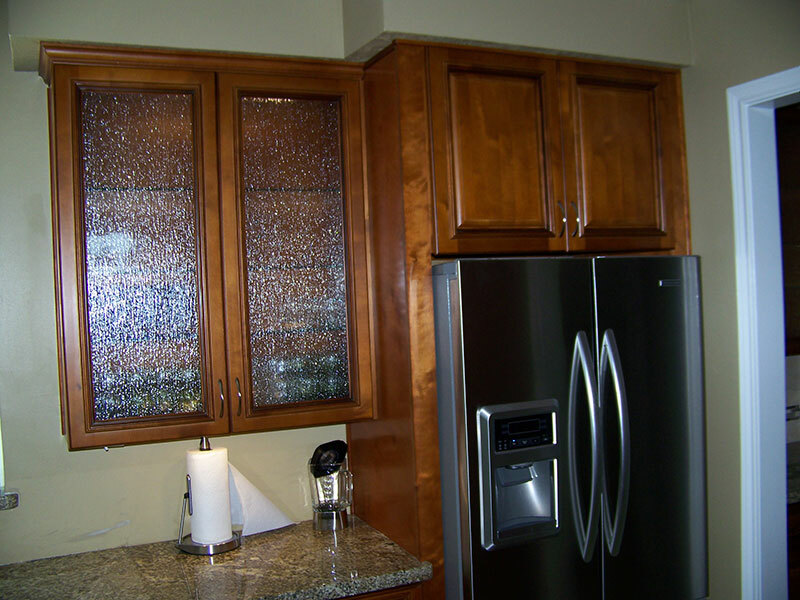 The upper cabinets with glass have rain glass with LED backlighting. 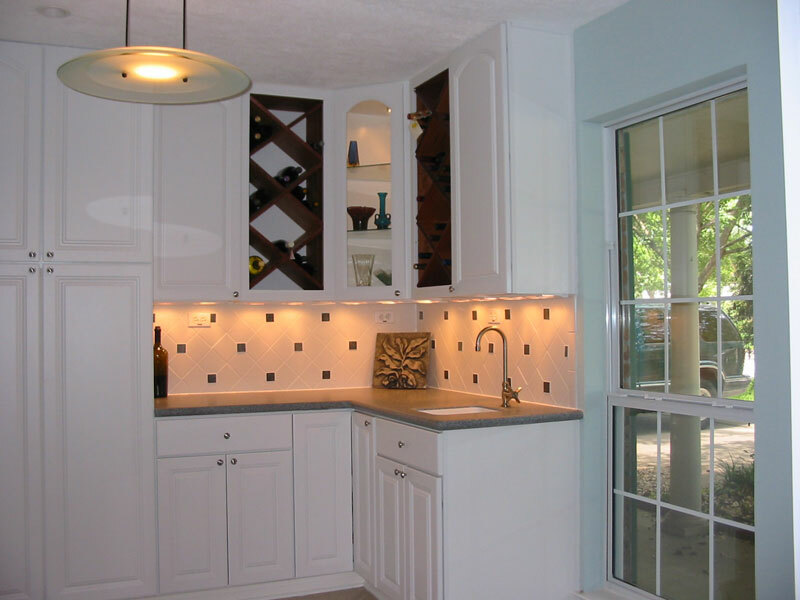 All the backsplash and wall electric service was updated to Decora Style, and dimmable LED under cabinet lighting was installed for efficient and “easy on the eyes” use (by a licensed electrician). 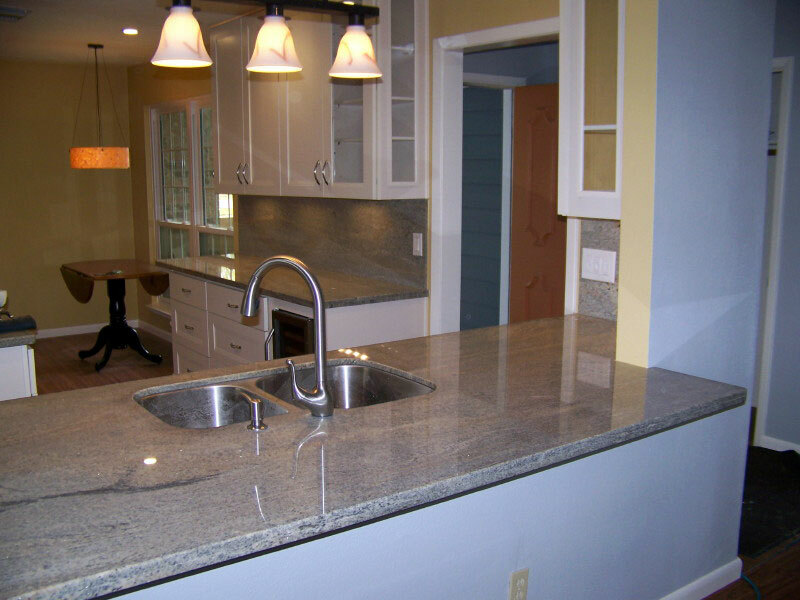 The selected granite was specifically chosen for the movement and patterns. 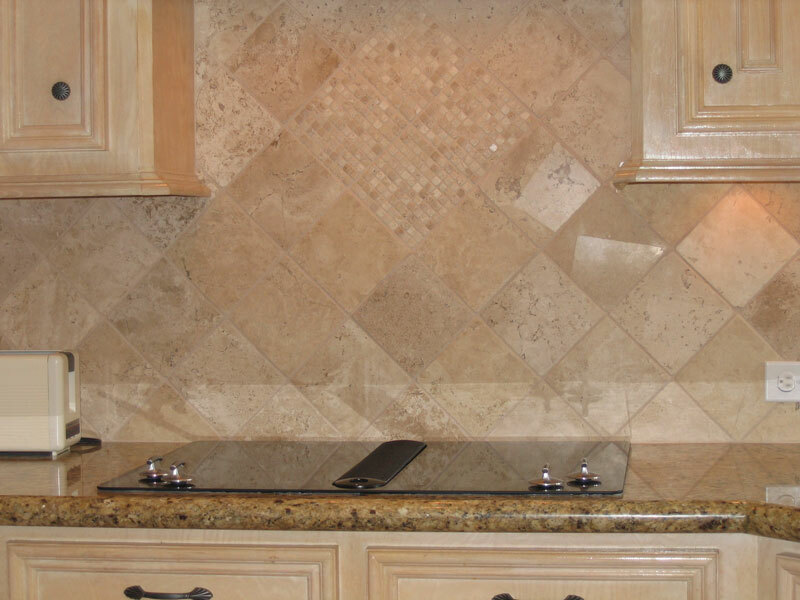 The Travertine backsplash is a mix consisting of a square set row with a blended stacked glass above, with a brick set to the upper cabinets. 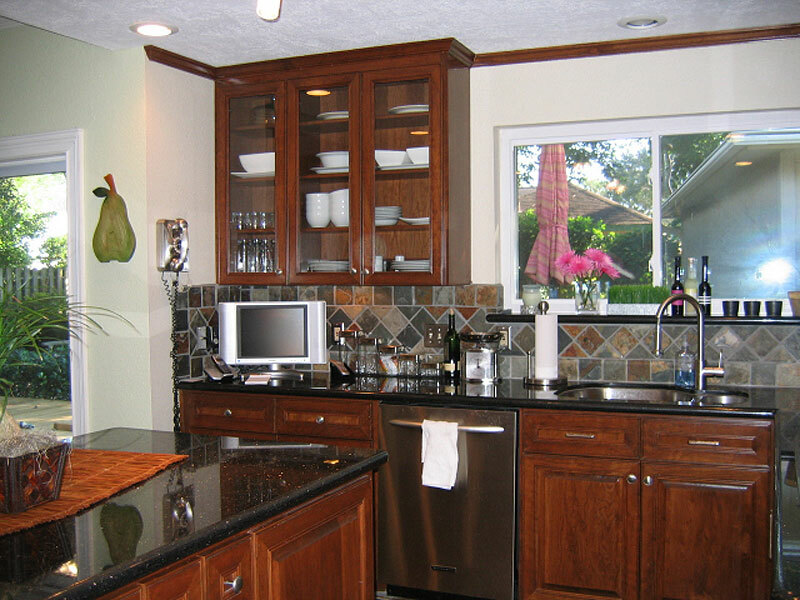 This remodel included the functional re-appointment of the entire kitchen, bar, and butler’s pantry. 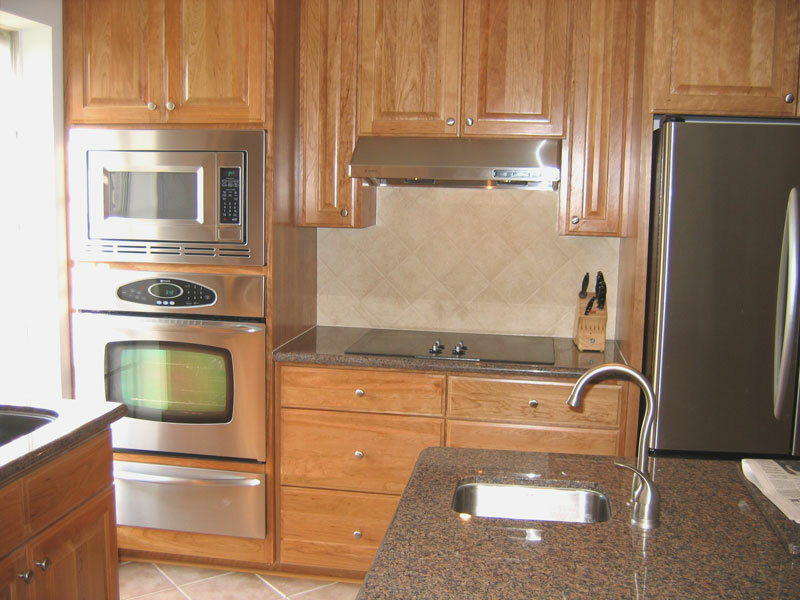 Most of the 47 year old houses in the Brookforest/Clear lake area have tight and fragmented kitchen spaces. 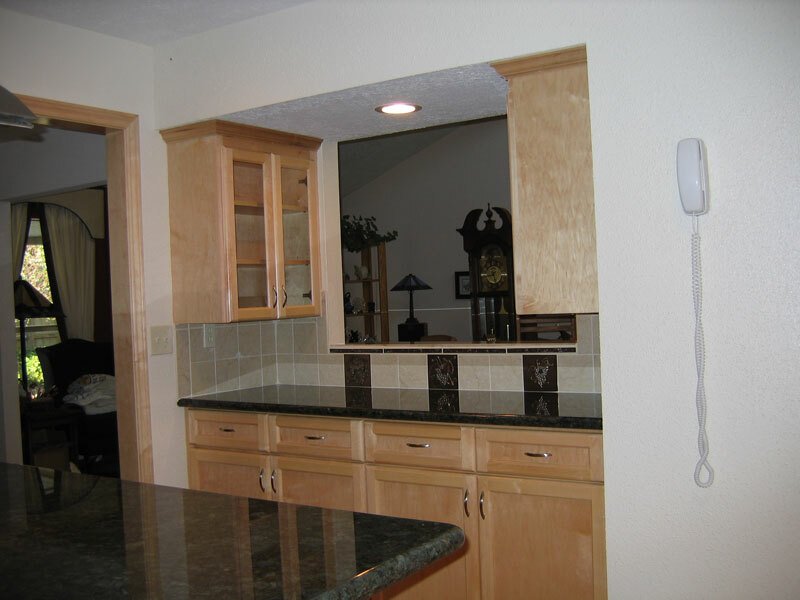 We separated the main working kitchen to allow flow, and retained all the storage to a new butler’s pantry, next to the powder room. 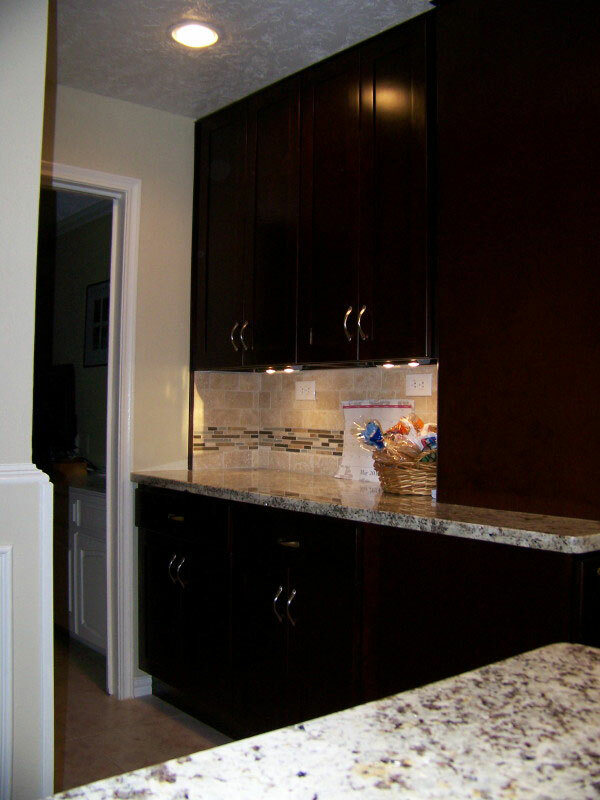 This kitchen was changed to a rich Expresso finish with a flat panel mission door. 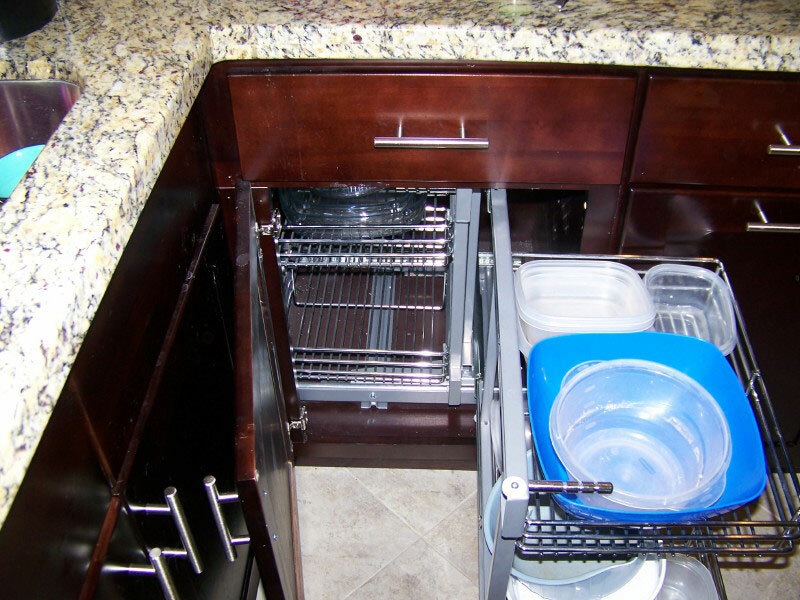 Besides the full extension drawer slides and pull outs two blind corner stainless pull outs were installed in the previously dead space from the inside corners. 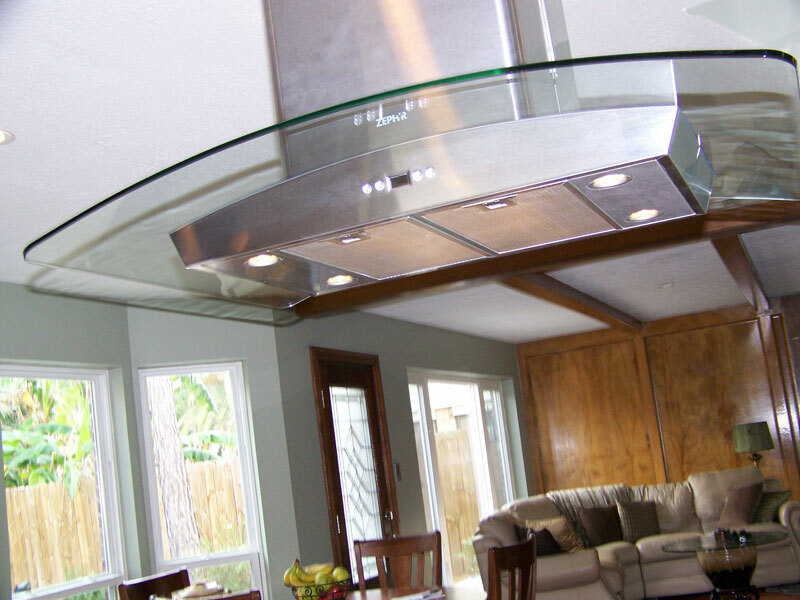 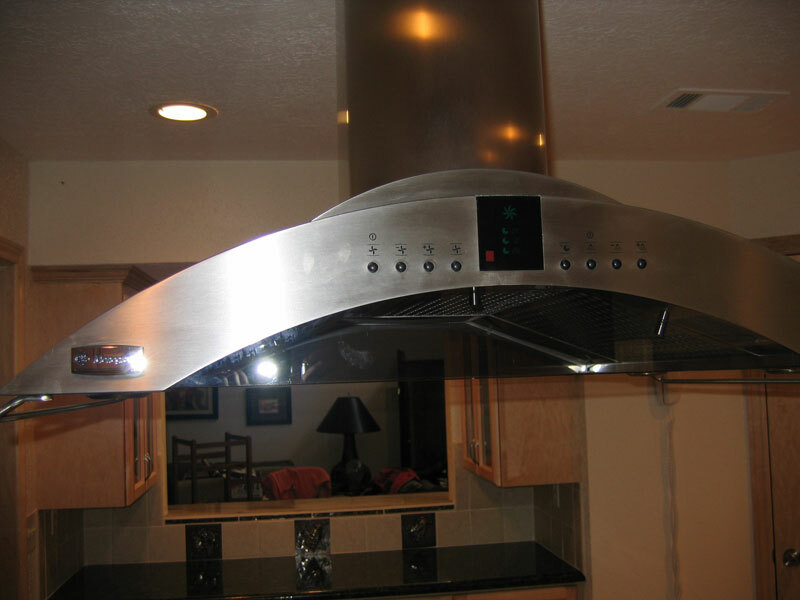 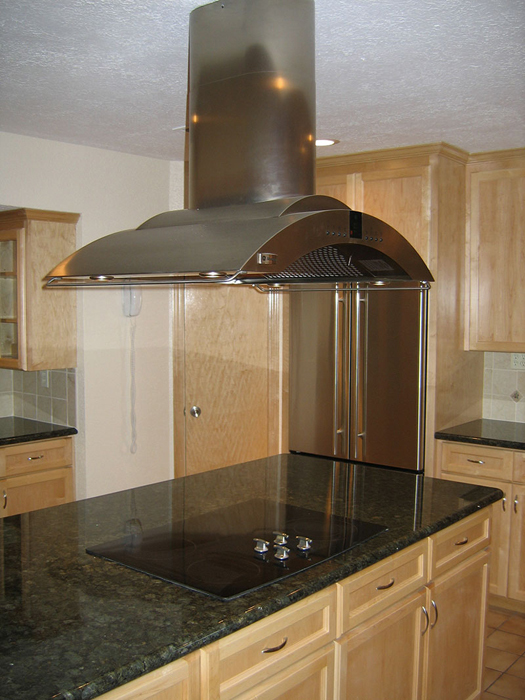 The exhaust venting was changed from a below grade venting to a new island style glass and stainless hood vent. 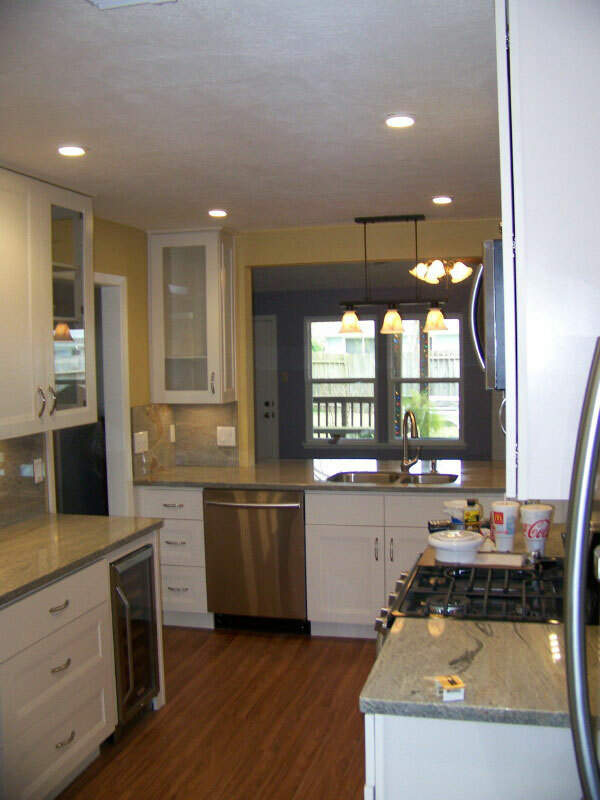 Licensed electricians updated the complete electrical system to new. 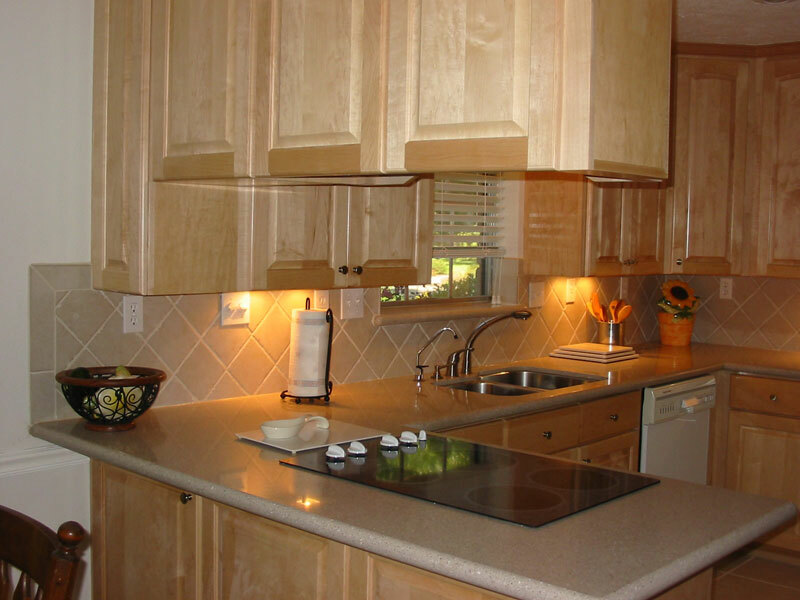 This included LED ceiling lighting, LED backsplash lighting and service, new service for all appliances, and new decora type wall plugs and switches. 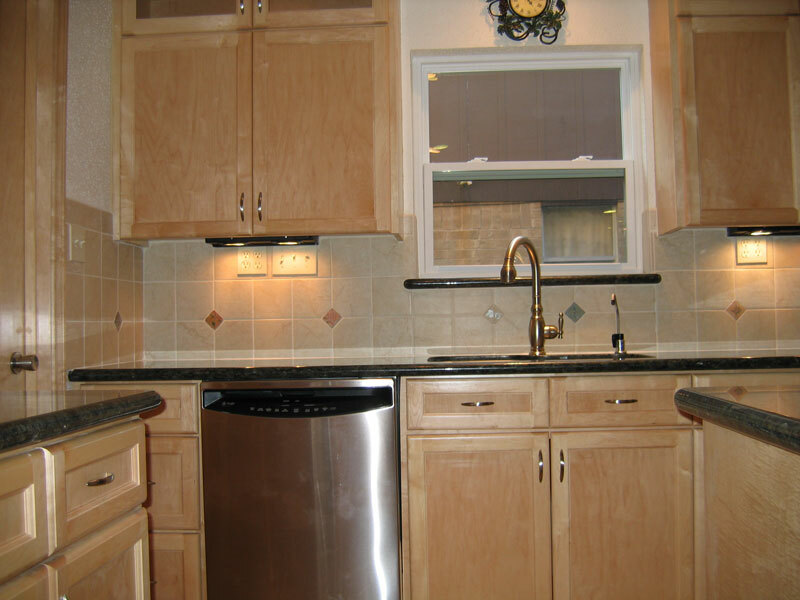 The backsplash selected was a (3X6) antiqued marble on a brick set. 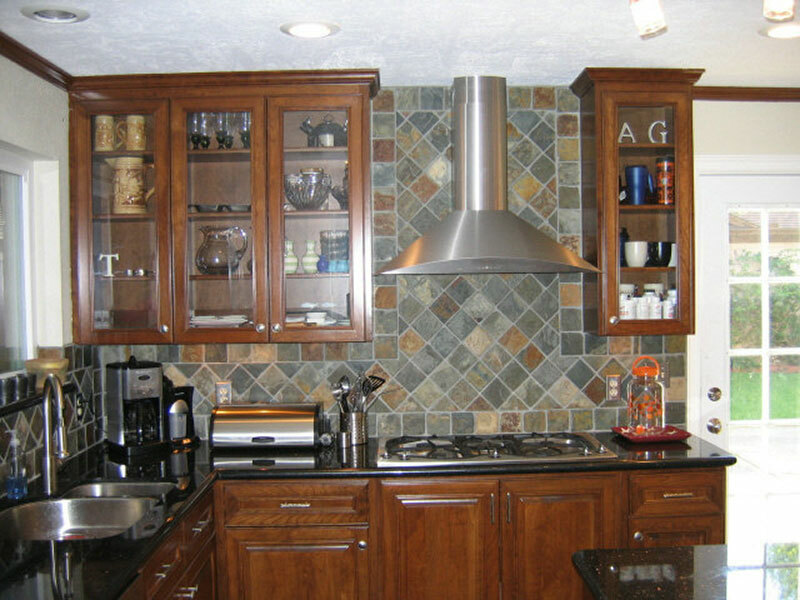 The client picked a mixed color stacked glass strip for accent and definition on the backsplash. 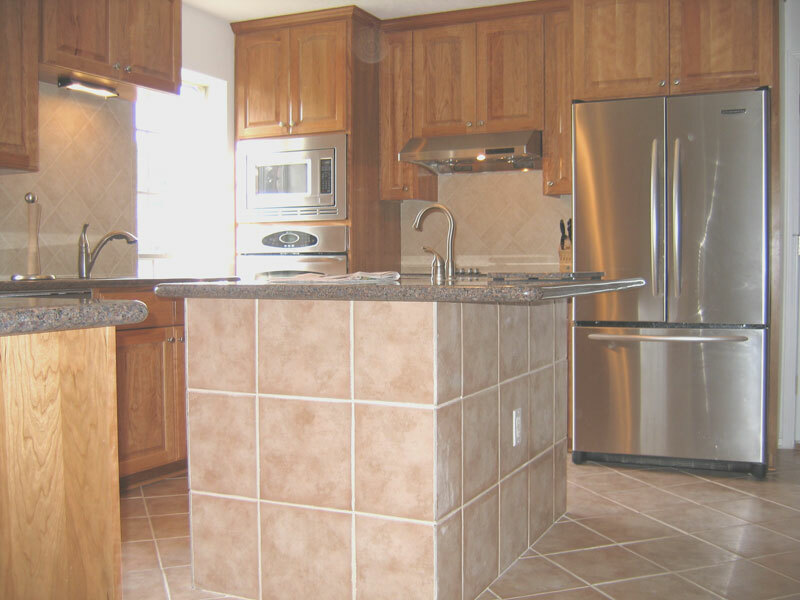 Many of the older Heritage Park homes are approaching 35 - 38 years of age and where they show it the most, is the kitchens. 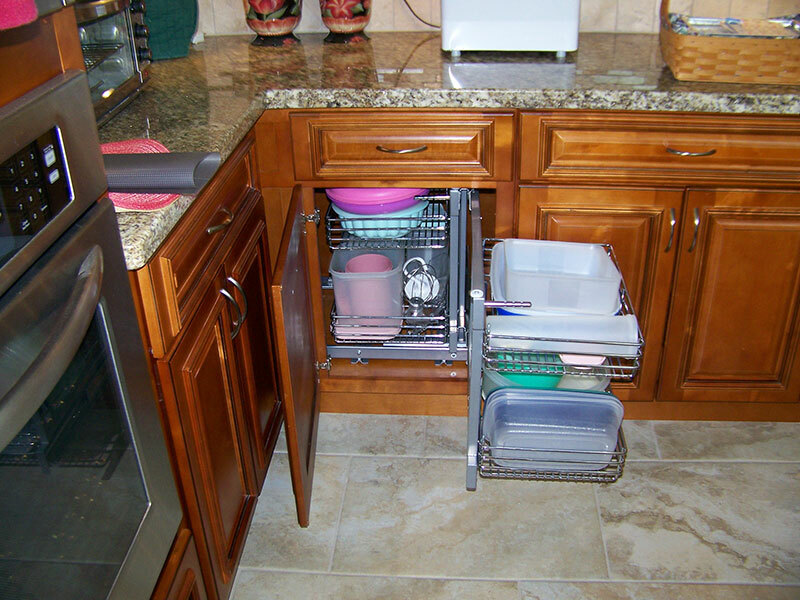 Many times they narrow and restrictive to where major food prep is a chore. 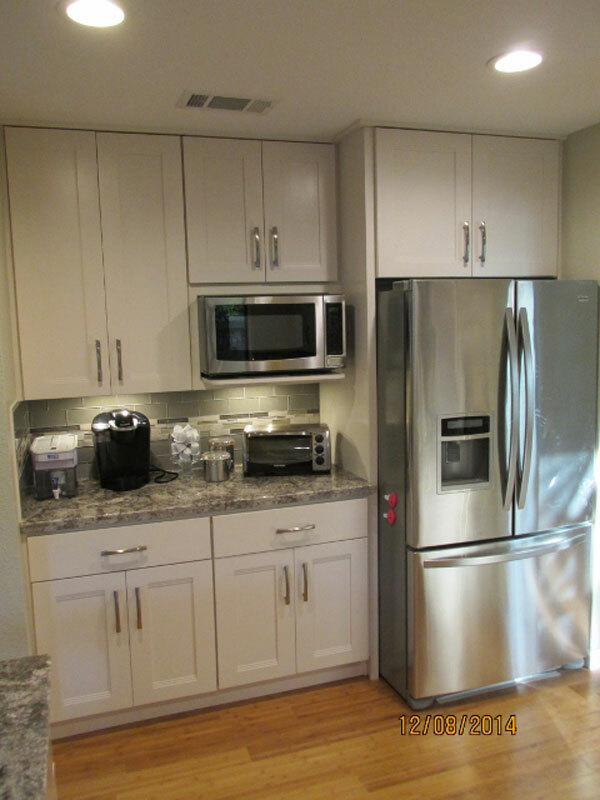 We opened this kitchen space up by removing unnecessary mid-walls, shifting the appliance location to where needed, and removing much of a divider wall. 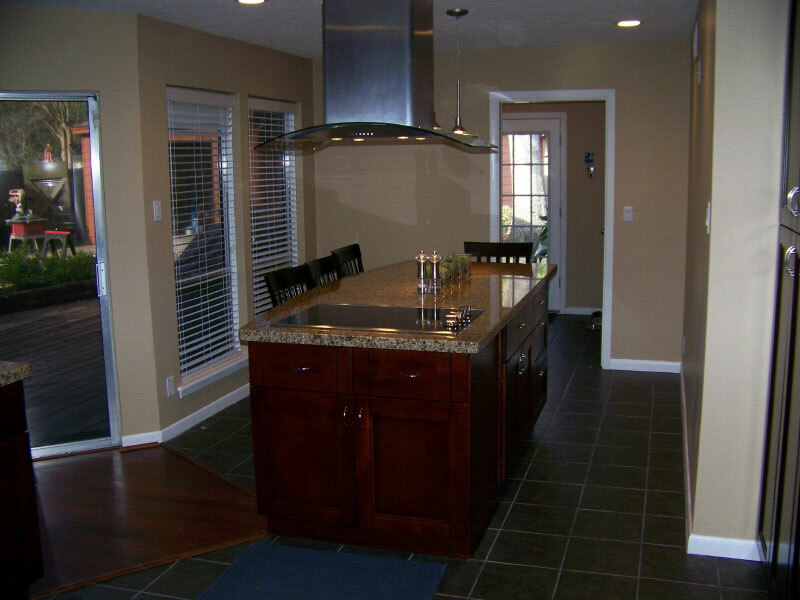 We reappointed the cook top and food prep area and extended cabinetry and countertops where walls once were. 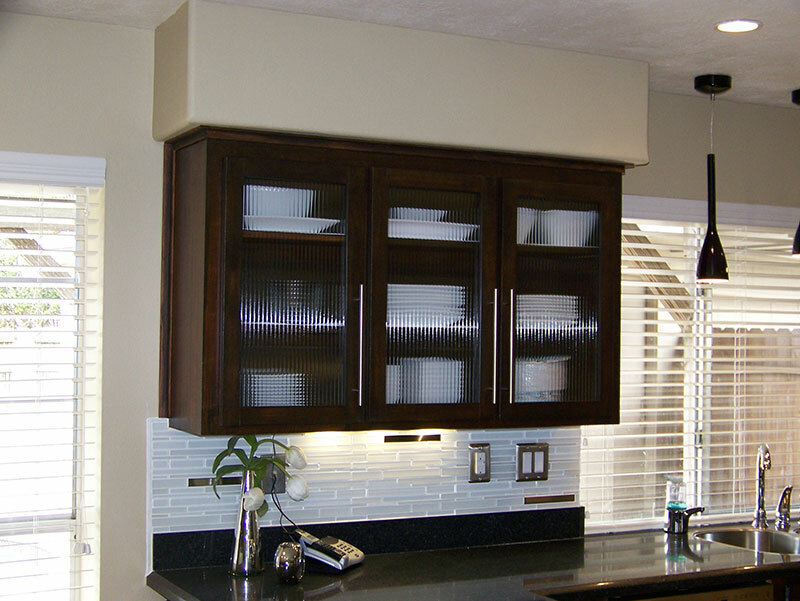 After all wall and ceiling electrical and lighting updates were complete (with licensed electrician), a rich Expresso stained cabinet was selected and installed to maximize storage and workability. 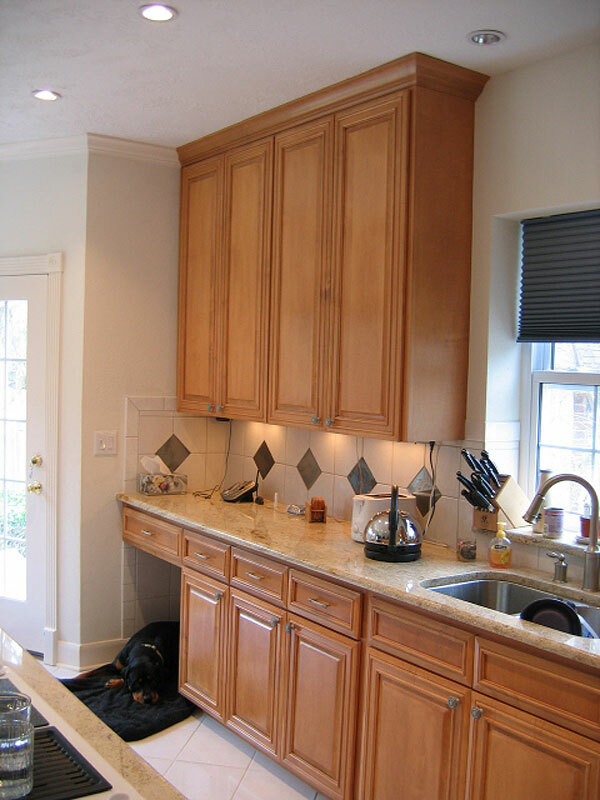 The upper cabinets having been changed to 42 inches tall, allowed an extra cubic foot of storage for every linear foot of upper cabinetry. 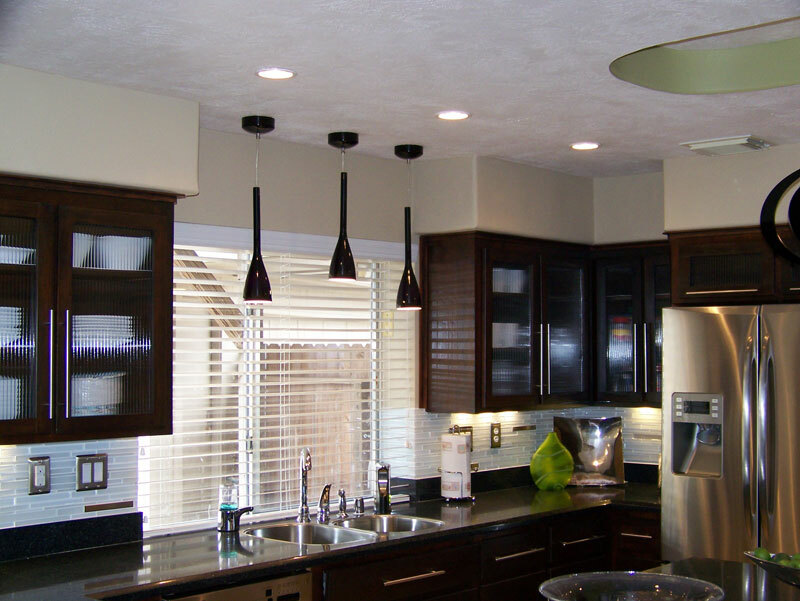 With LED under cabinet lighting (licensed electrician), this kitchen can operate and be well lit with the ceiling lights off while entertaining or for down time. 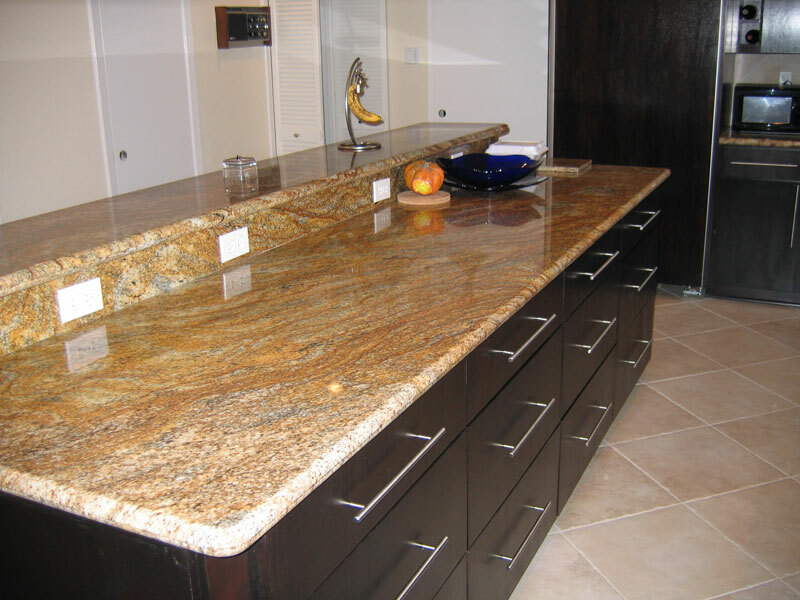 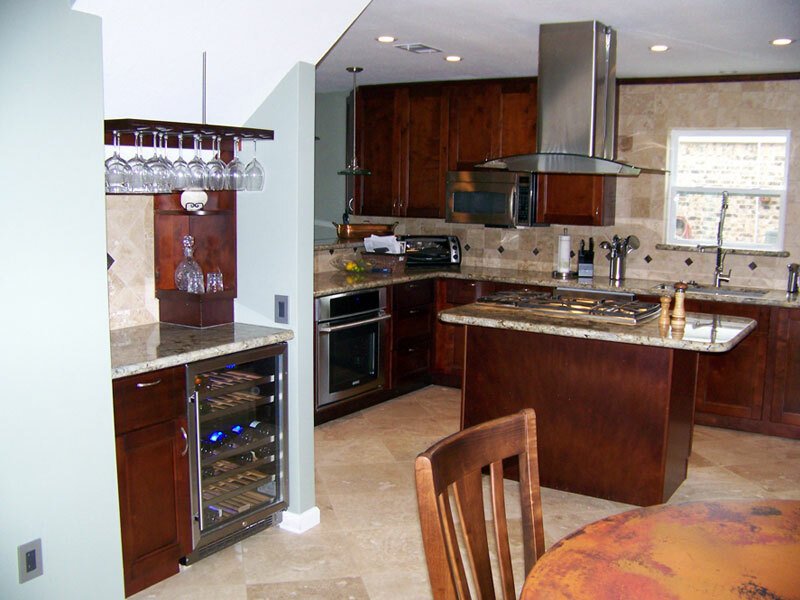 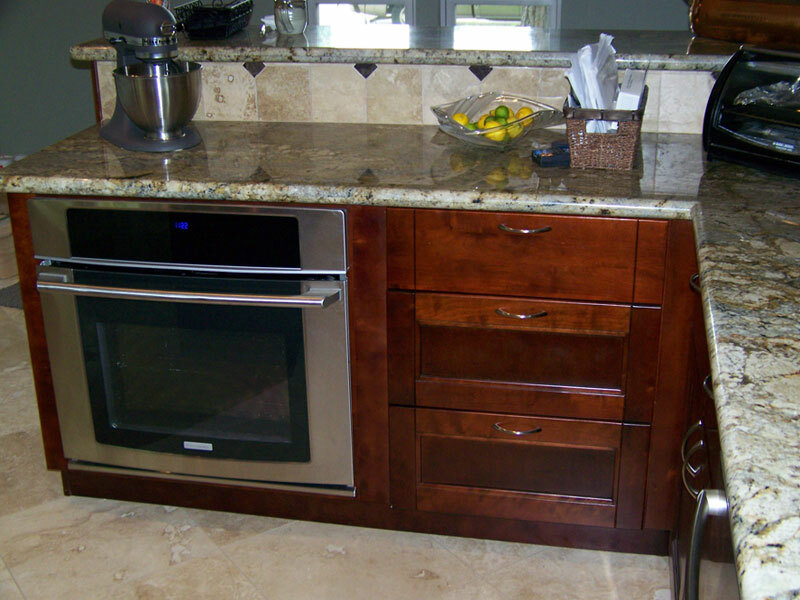 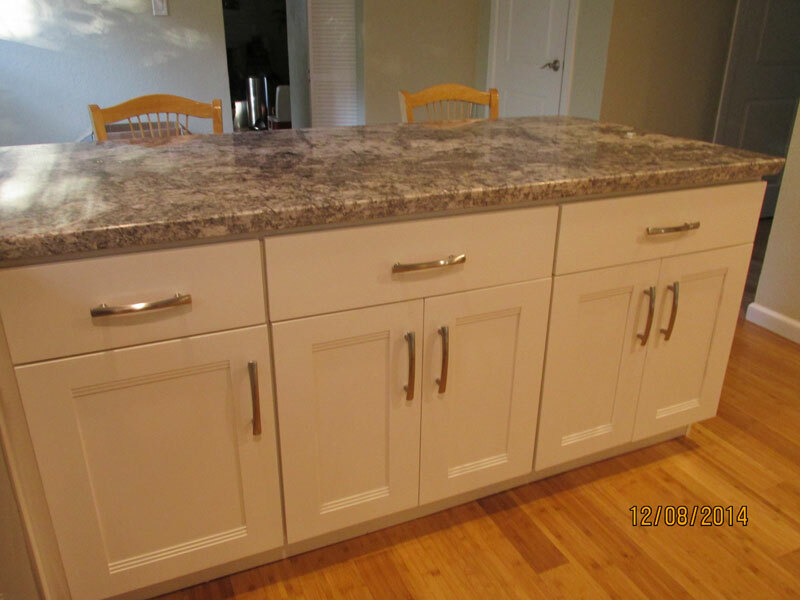 The custom granite was installed with an extra long and wide bar area level with the cuntertops. 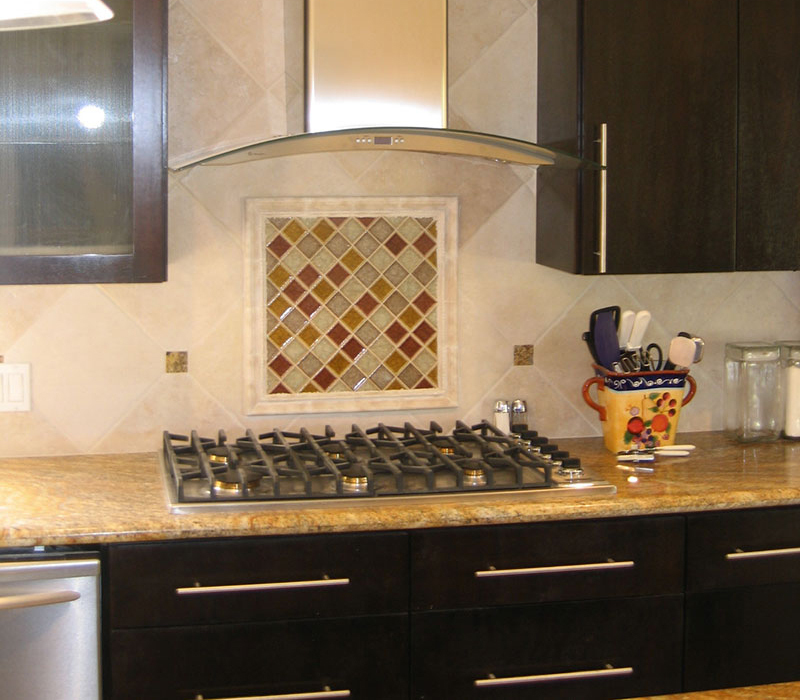 The backsplash tile was ivory marble with a selected stacked glass tile as an accent strip mid wall. 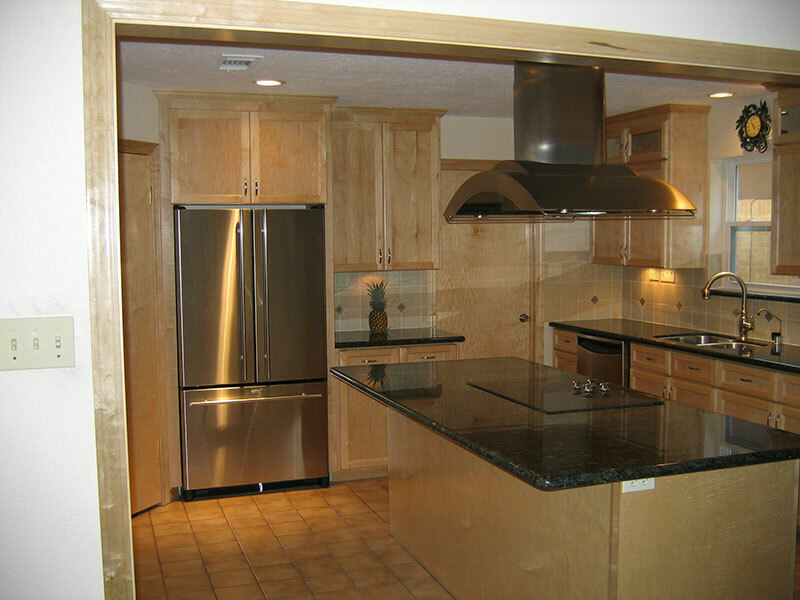 This Bookforest subdivision kitchen was renovated from the 45 year old dingy kitchen to an open concept and modern kitchen. 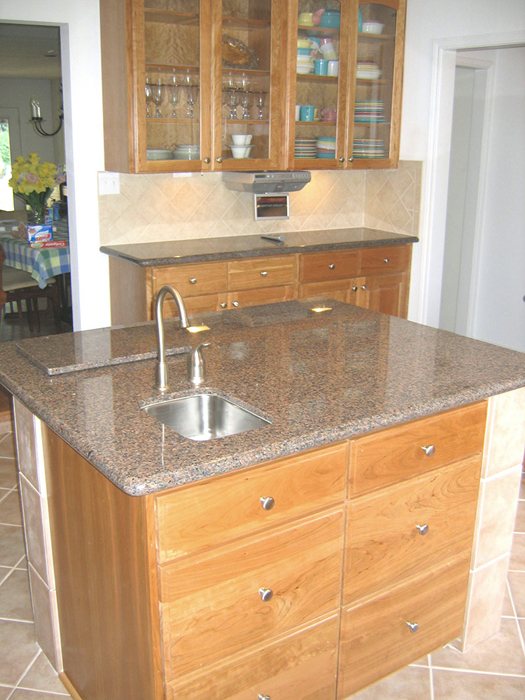 The cabinetry is cherry stained maple with all-wood construction. 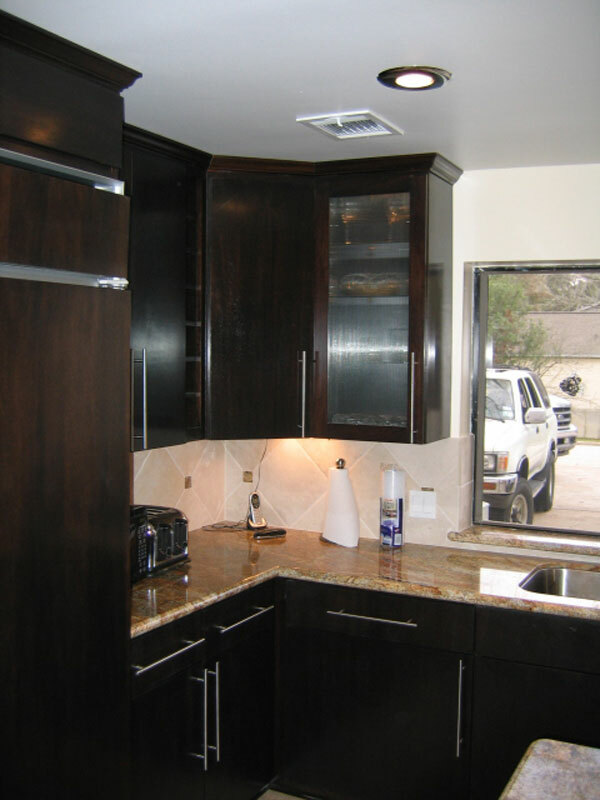 The doors are a flat panel mission style. 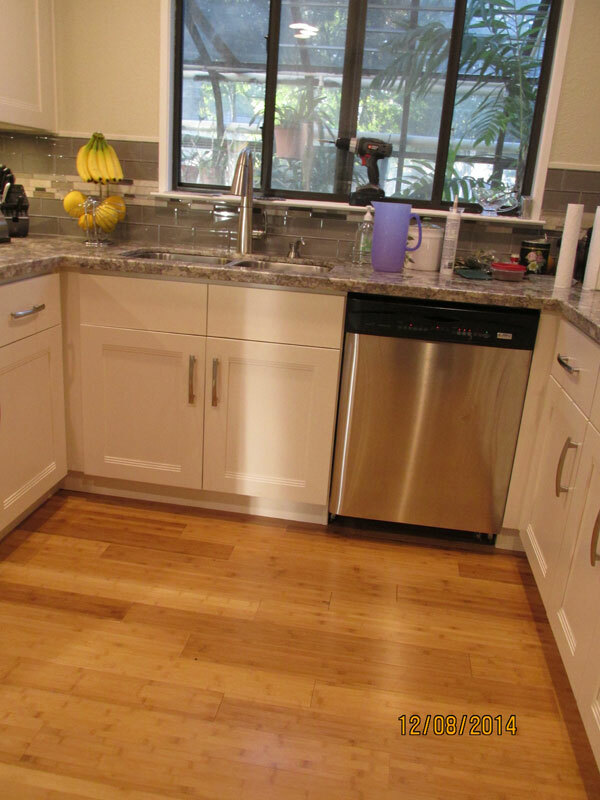 Water and electric was run to the new island thru the slab and the old cherry hardwood floor was matched and blended for uniformity. 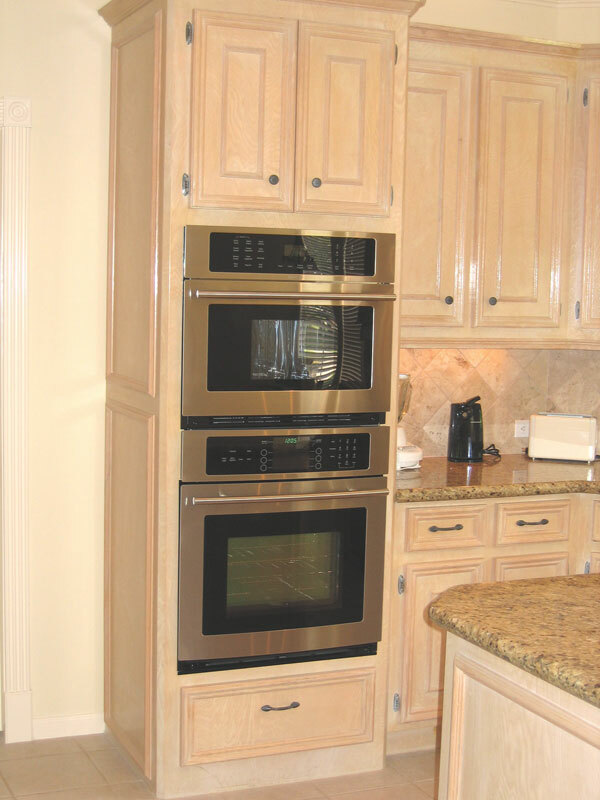 All the appliances are new, and in new locations for a custom layout. 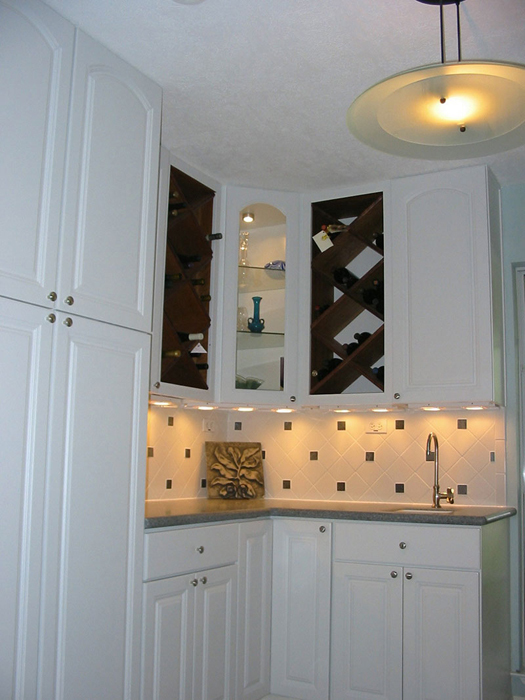 LED recessed can lighting, LED under cabinet lighting and backsplash electric was installed new and updated (by a licensed electrician). 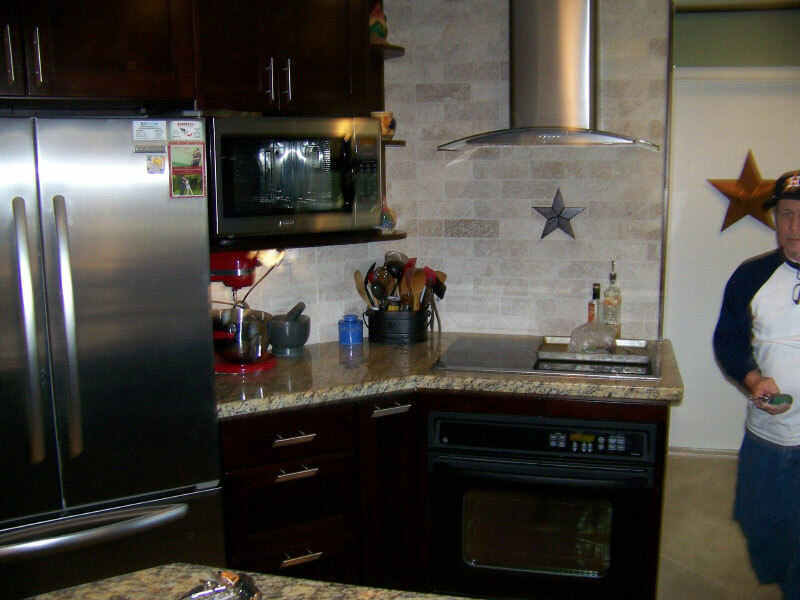 The backslash tile is a brick set antique travertine. 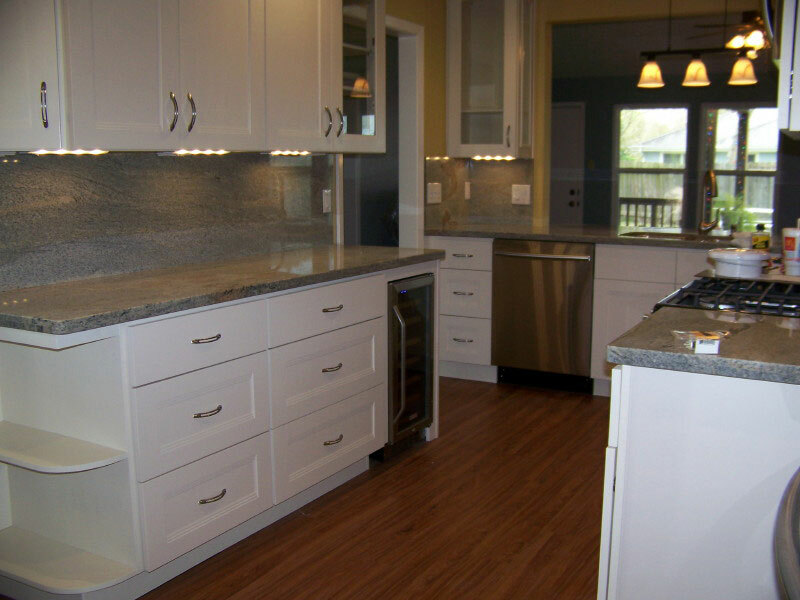 Natural Maple cabinets with a clear laquer finish. 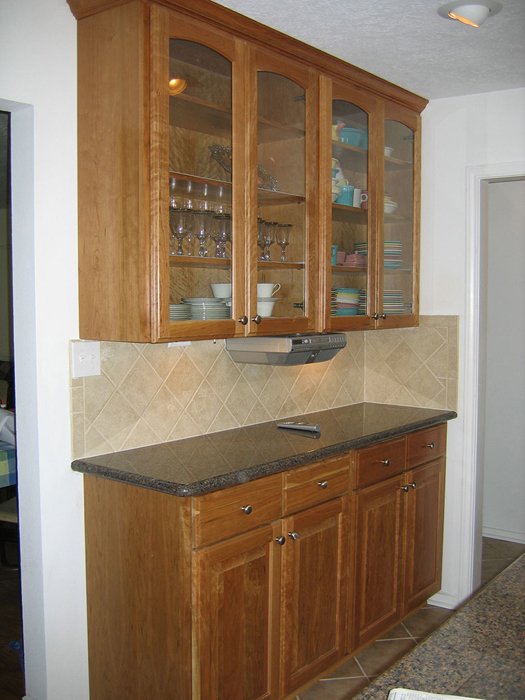 Oak kitchen that was refinished to a custom color. 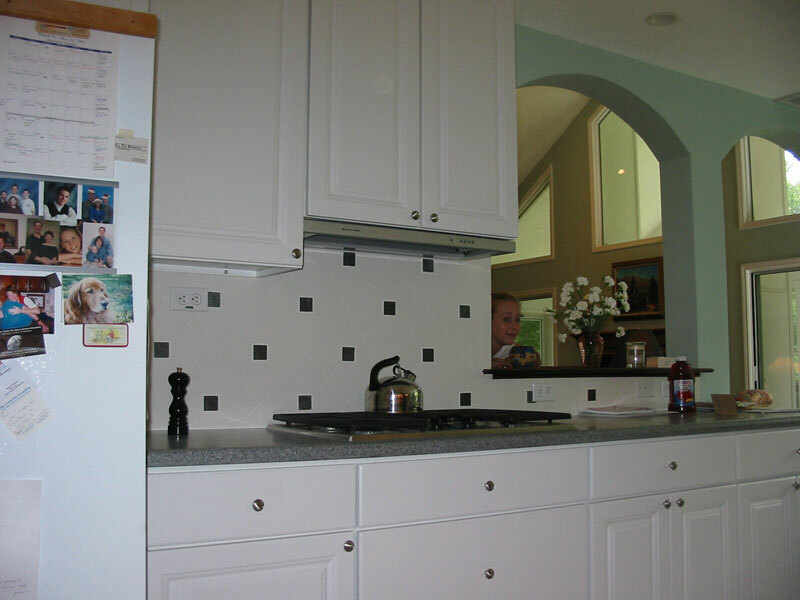 Backsplash is clear/white stacked glass. 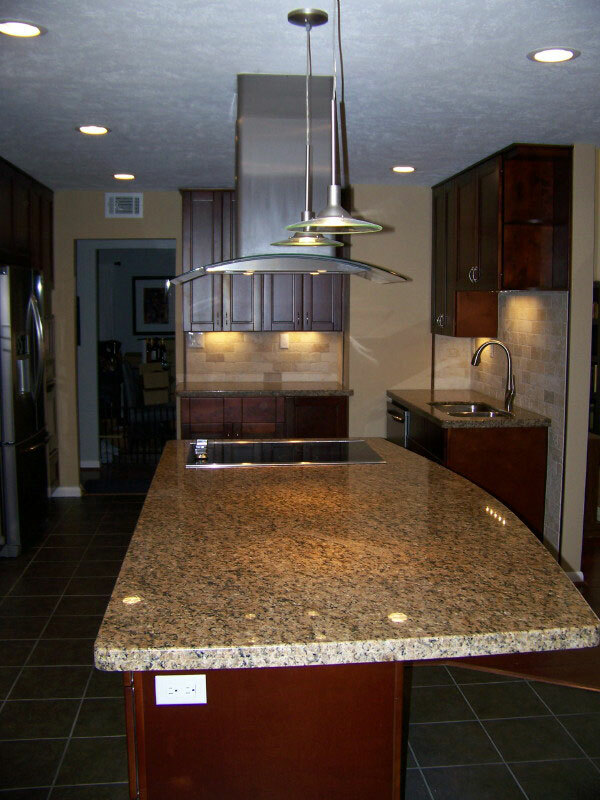 Countertop is Avanza, by others.